Yes, I understand that most people use their GPS to get from A to B. Pity. The true joy of a GPS is its stubborn determination to get you to your destination — regardless of the deviations and detours from its directions. This is very liberating to the intentional meanderer. No longer do you have to worry if the lure of an un-programmed left turn will leave you hopelessly lost — and, God forbid, have to ask for directions. Your GPS cares not. It will simply re-group and provide you with a new path — and never pout or be resentful of your willful disregard of its instructions. Into the hot soup that is our summer of 2010 we drove – across the Burlington Bristol Bridge and north up Rt. 206. Mercer County strides north and east of Philadelphia along the Delaware River in the crux of the elbow that is New Jersey. Compared to my prior destination of South Jersey’s Salem County with its population of about 65,000, Central Jersey’s Mercer County is home to 370,000 people. And with a population density of 1,552 per square mile, it is eight times more dense. Mercer county has an entirely different feel from the more hard-scrapple South Jersey. Mercer County is home to elite private prep schools and Princeton University as well as numerous multi-national corporate headquarters. While there are pockets of farmland, Mercer County offers little in the way of Salem County’s long isolated country roads. And Mercer county’s roads provide small allowance to drivers going nowhere in particular — slowly. Here, riding lawn mowers that maintain manicured lawns surrounded by painted white fences far out-number farm tractors. Lush, clearly wealthier, and less tranquil, our trip included a mid-afternoon traffic jam through Princeton. No clothes drying on lines in the sun. Pools more likely to be in-ground than above. While there were occasional broad vistas across open fields, more likely those fields have given way to housing developments, garden apartments and country estates. It is of note that while Trenton is the state capital, the governor’s residence is in Princeton. 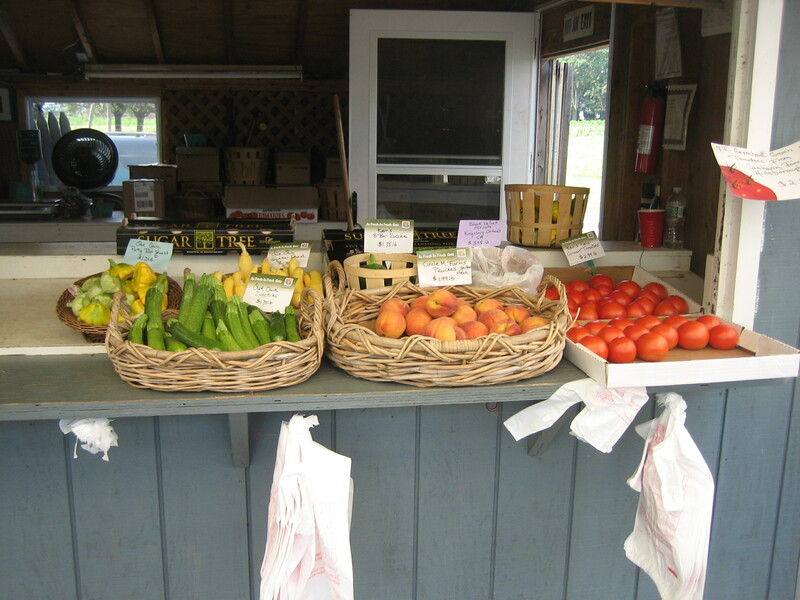 On the other hand, its farm stands are more fully stocked. A cardinal principle of intentional meandering is to not let your destination deter you from a detour — especially if a hot dog is involved. 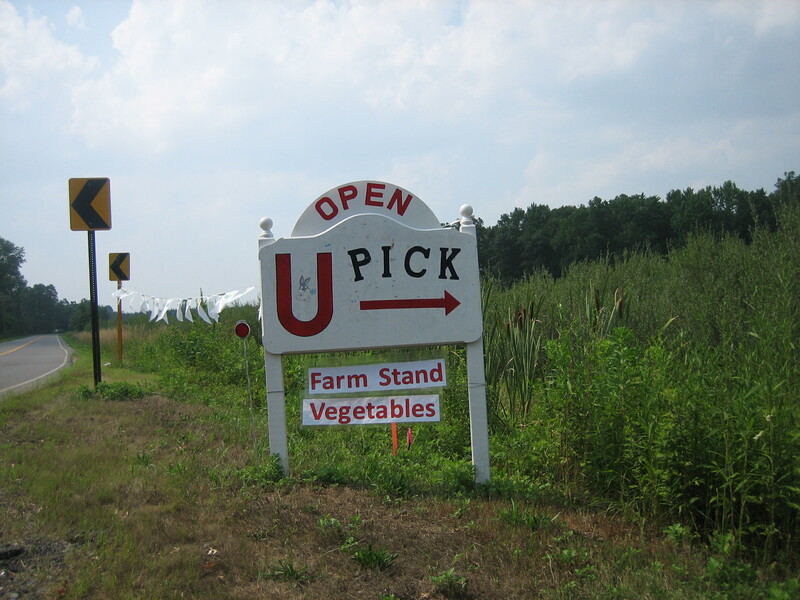 And so, as we drove north through Burlington County on Route 206, we passed an eye-catching sign on the opposite side of the road. A U-turn brought us to Russ Ayres Hot Dogs, 680, US Rt. 206, Bordentown. This just goes to show the importance of a good sign. The pastel yellow shack and bold sign were eye-catching and said something good was going on inside. 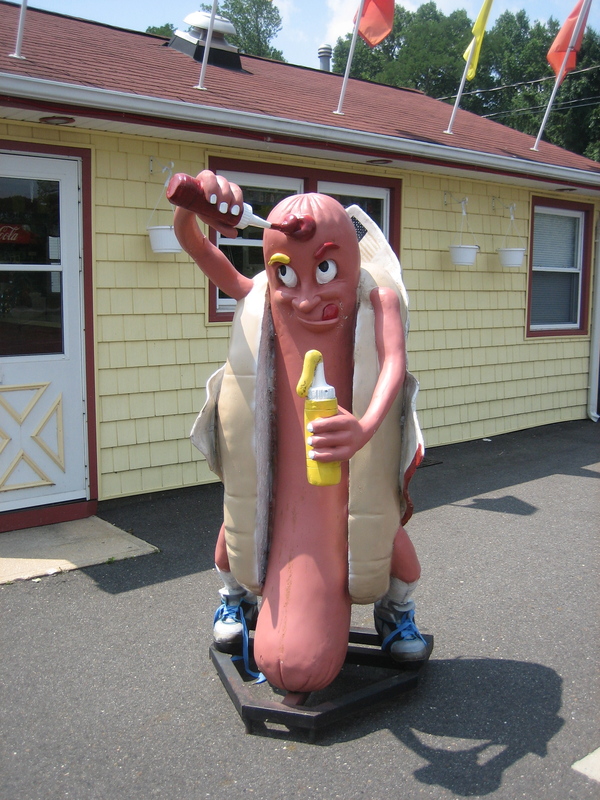 Guests are greeted by this slightly scary character who is dispensing ketchup as well as mustard despite the store’s admonition that ketchup is just for hamburgers — a product unavailable from Russ Ayres. Russ sells just hot dogs – $2 with the works – onion, sauerkraut and mustard. Bigger appetite? 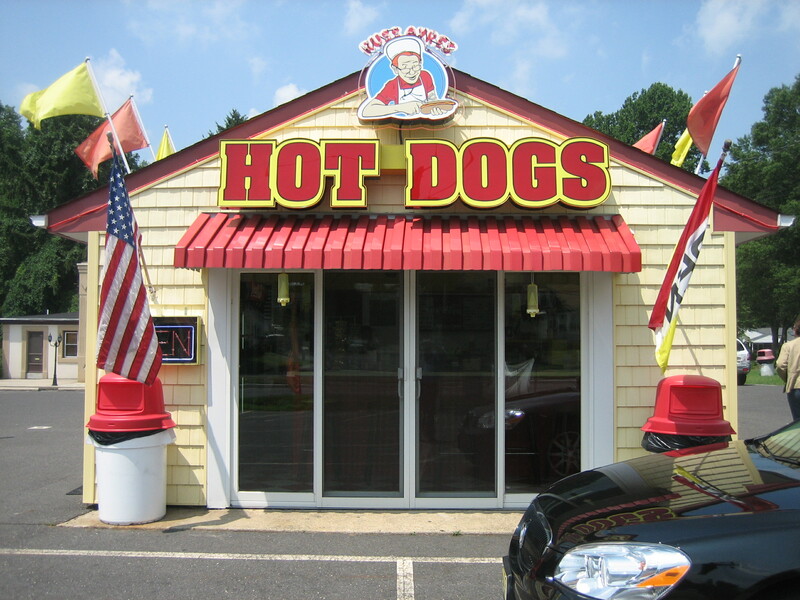 Try the more elaborate chili dogs, cheese dogs and chili-cheese dogs. Get them to go or find a seat at the six person counter. The standard assortment of bottled beverages is available. We went for a pair of hot dogs with the works. After all, this was really a late morning breakfast with a full day ahead of us. 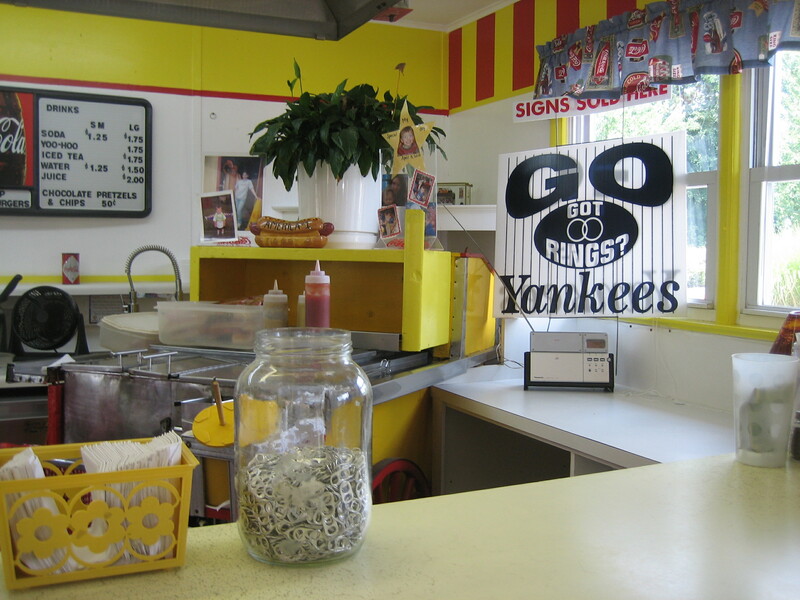 It was in Russ Ayres Hot Dog Stand where we learned that despite our apparent proximity to Philadelphia and the Phillies, the Go Yankees sign declared we had left home and our Phillies behind. Nestled behind Russ Ayres was Gelato’s, a stand that offered the ideal follow-up to our hot dogs. Think of it as a mini-food court. Christina likened the scene to something you might find along the road in Italy — a notion I thought was quite a stretch. 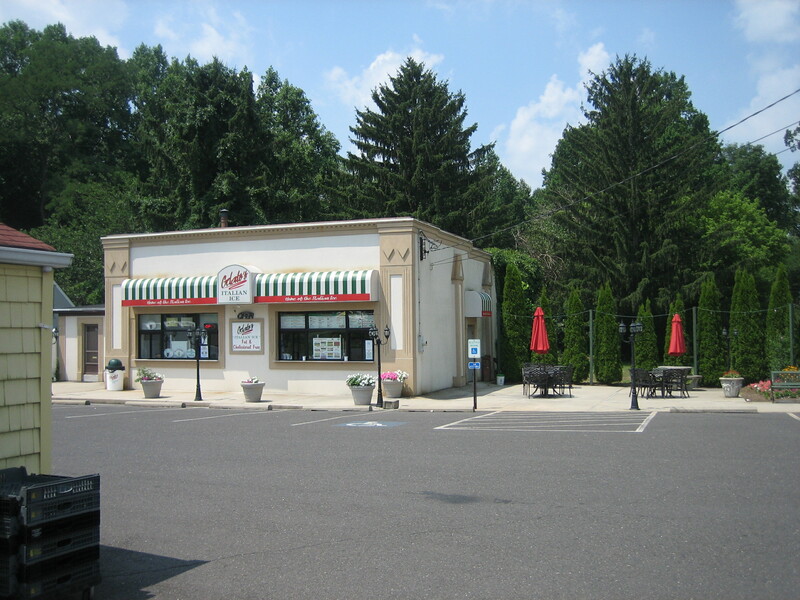 Still, the brace of conical evergreens, red umbrellas and wrought iron tables and chairs provided some distraction from the awning reminiscent of Rita’s Water Ice. 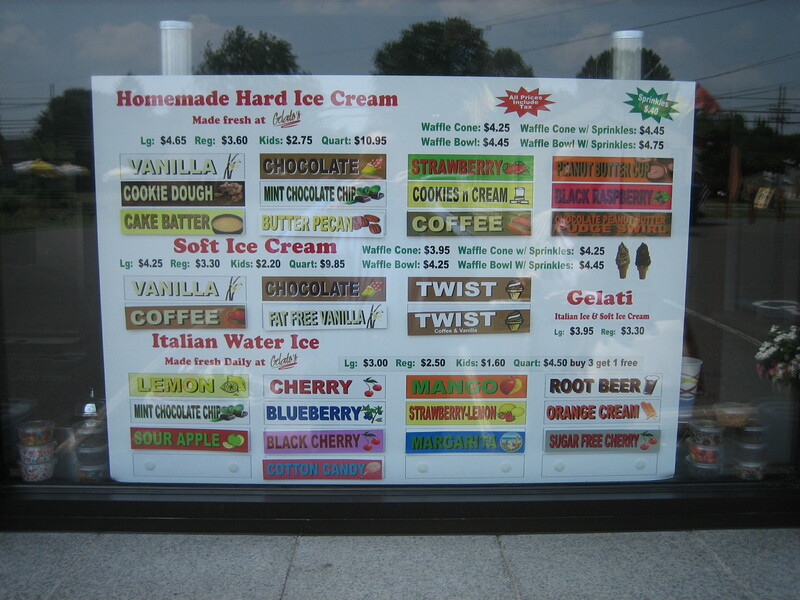 My preference to try their homemade ice cream yielded to Christina’s preference for a black cherry ice layered with soft vanilla ice cream — something that is available at your local Rita’s. Our GPS setting to avoid highways took us through the streets of Trenton as we headed to our first stop, the Trenton Farmers Market. As we journeyed along we noted a Trenton pierogi shop that we would have visited, but for our recent hot dog detour. 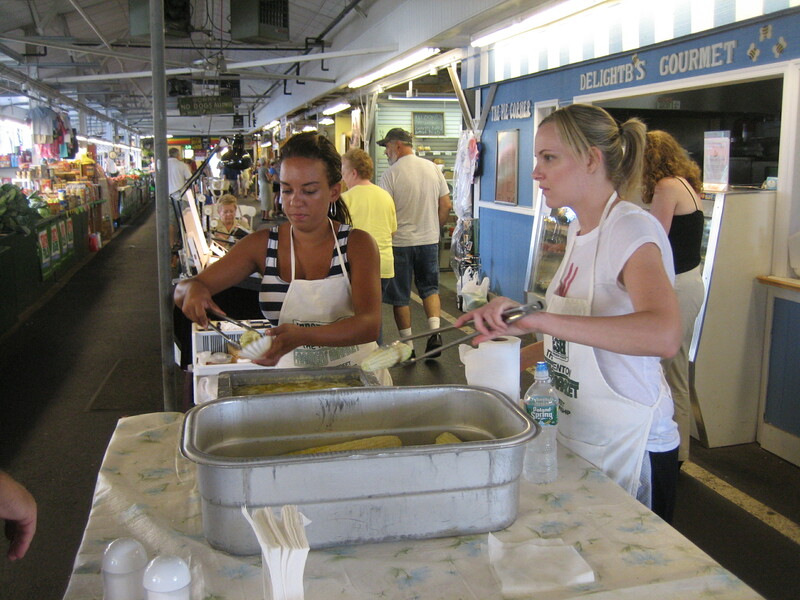 Seemingly out of an era that preceded glizt, the Trenton Farmer’s Market, open daily except Monday, is home to a combination of farmer’s and ethnic stalls with an occasional craft or thrift table – a sort of 1950’s Reading Terminal Market in miniature. 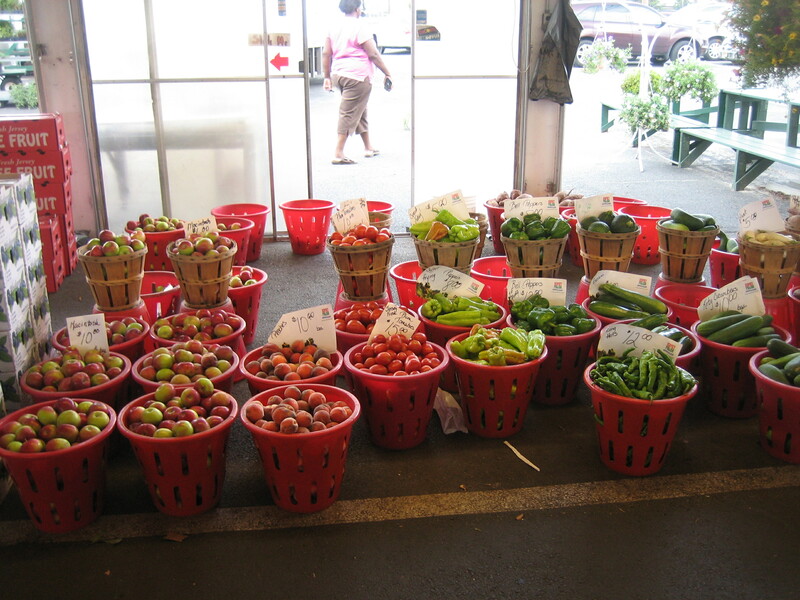 As a farmers’ market is a collection of farm stands, it provided a preview of the produce we would find on the road. A little more research or curiosity would have taken us to the Halo Farm Store — famous for ice cream and dairy products, located just across the parking lot from the Farmers Market. It’s not the White House, but it does have an East and West wing. Actually, shaped like a cross, there is also an un-named north and south wing. Local farmers truck their produce to their stalls in the Farmers Market. Jersey is famous for corn and tomatoes. 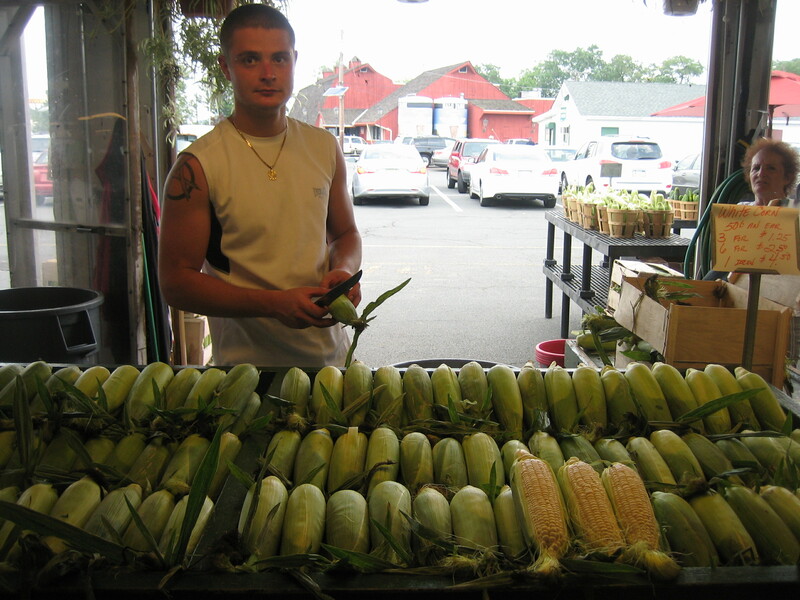 Nearby fresh picked Jersey corn. Despite the searing heat, most Mercer county tomatoes were still a week or so away. Our July 16th visit was Jersey corn give-away day. You can buy by the piece, by the pound or by the bushel. Peaches, hot peppers — never sure what to do with an entire bushel of hot peppers — zucchini and cucumbers are in abundance. And it’s berry season. Not strawberries — they are an earlier season fruit, but lots of blueberries and luscious blackberries — the best of the berries though often needing a touch of sugar to pick them up. 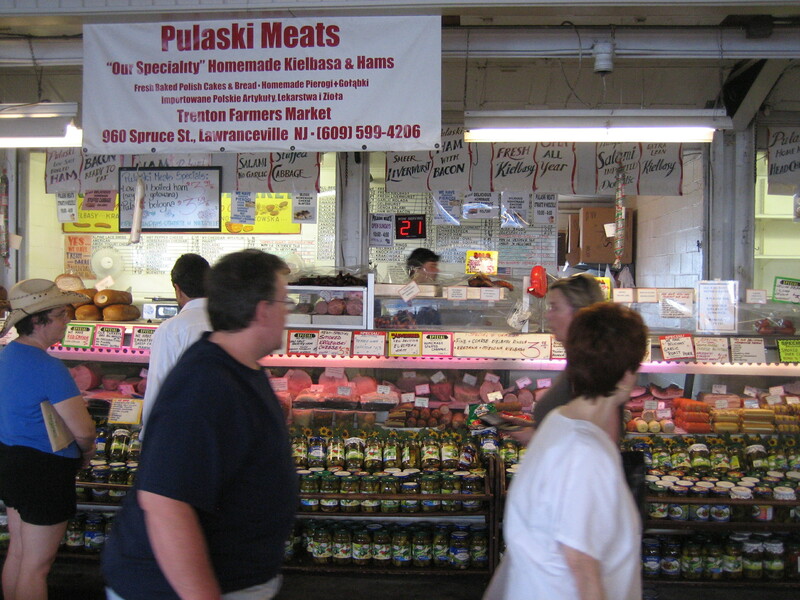 In addition to farm fresh produce, the Trenton Farmers Market is lined with ethnic stands including Pulaski Meats. 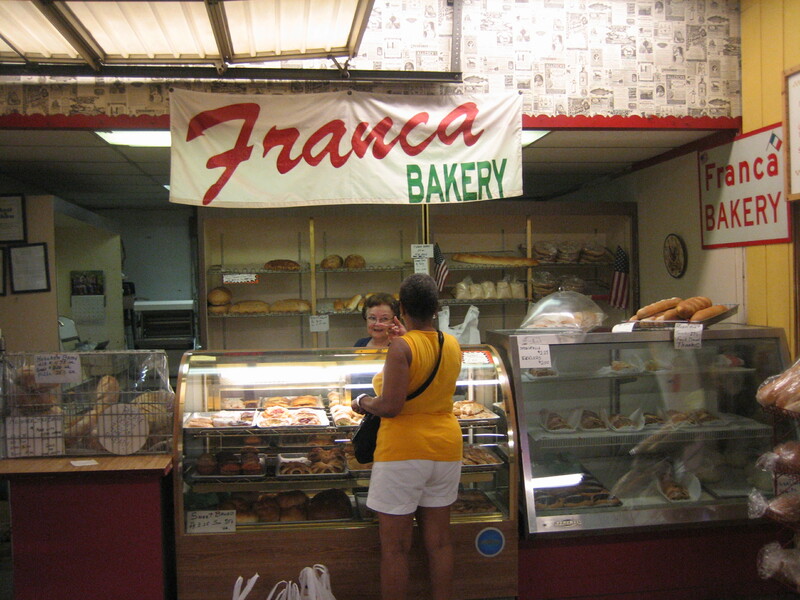 And an Italian bakery that reminded Christina of sweets her grandmother baked. A cheese case worthy of sophisticated big cities. It’s not showy, but it has a gritty authenticity. A Pennsylvania-Dutch stand sells fried chicken, roast pork and spare ribs — eat in or take-out. 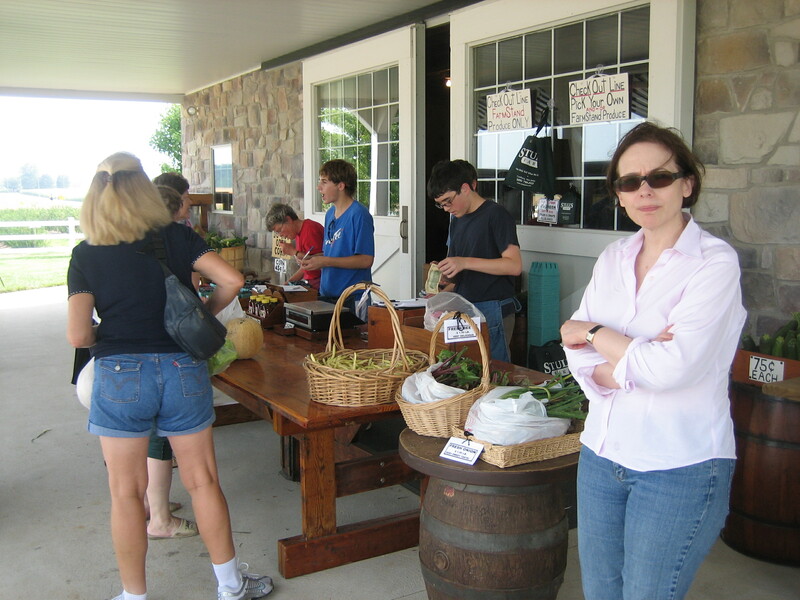 Included among the farm stands and prepared food stalls was a modest table sampling and selling wines from Unionville Vineyards. 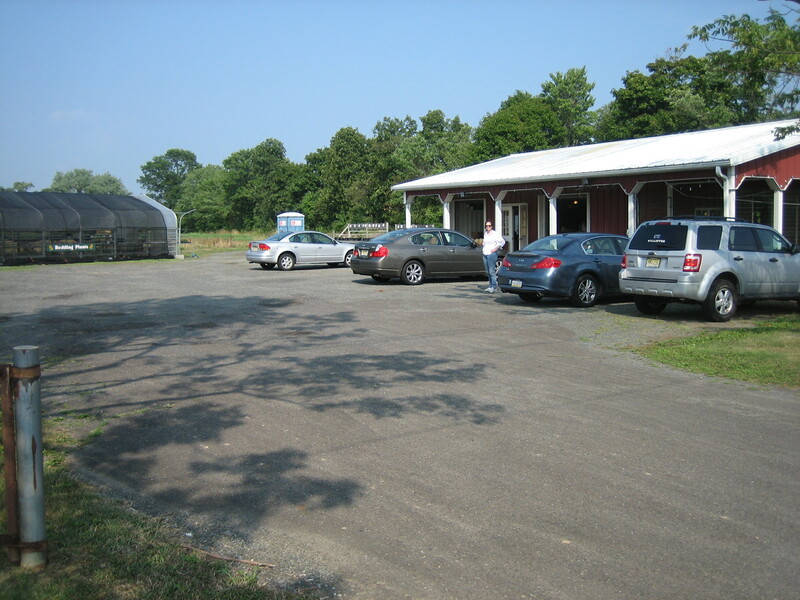 Unionville Vineyards is located in nearby Ringoes, in north neighboring Hunterdon county. Very drinkable and fairly priced, we bought three bottles: a 2006 Heritage White (mostly semillon grapes), a non-vintage Big Red Fox, mostly syrah grapes and a 2008 Fields of Fire, an attractive dry rose from Pinor Noir grapes. 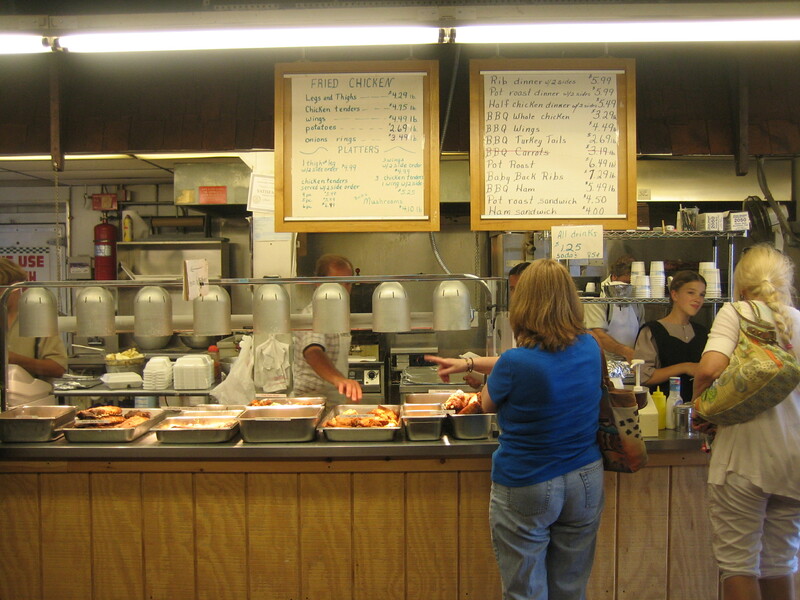 Nestled in a separate building across from the Framers Market is a fresh fish store called The Crab Shack. 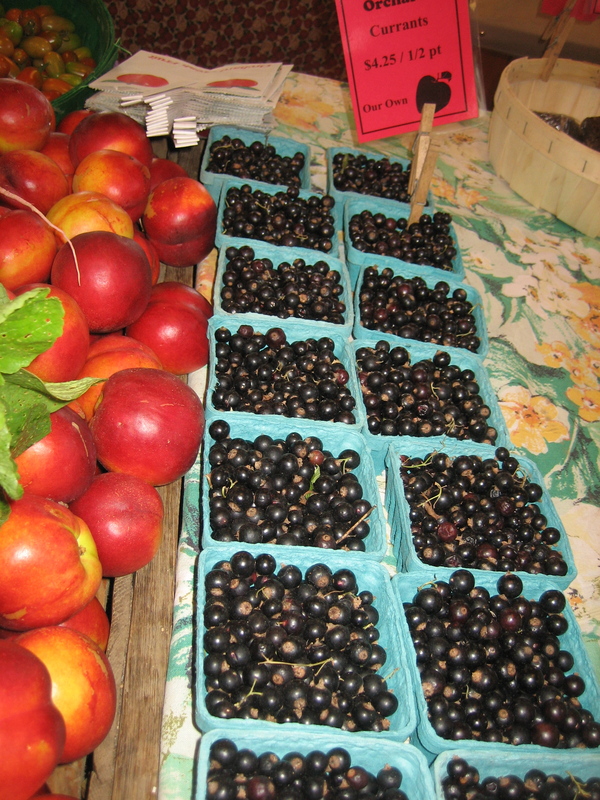 A Saturday’s trip to the Trenton Farmers Market will provide you with everything you need for a delicious low-stress Sunday dinner for friends and family — the freshest of produce, butcher-worthy meats and fresh fish to grill and just-picked fruit and fruit pies for dessert. 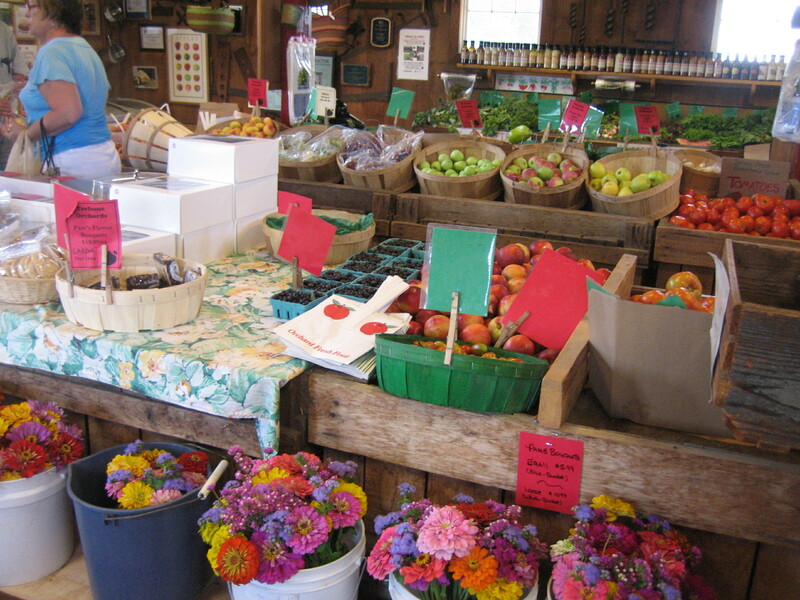 Farm stands exist on many scales. Some are modest mom and pop operations. Mom and pop toil long hours doing the lion’s share of the work. They may get some help from sons and daughters and grandpa and grandma – but they are mostly family affairs. Marketing consists principally of a roadside sign and a kind of “build it and they will come” approach. 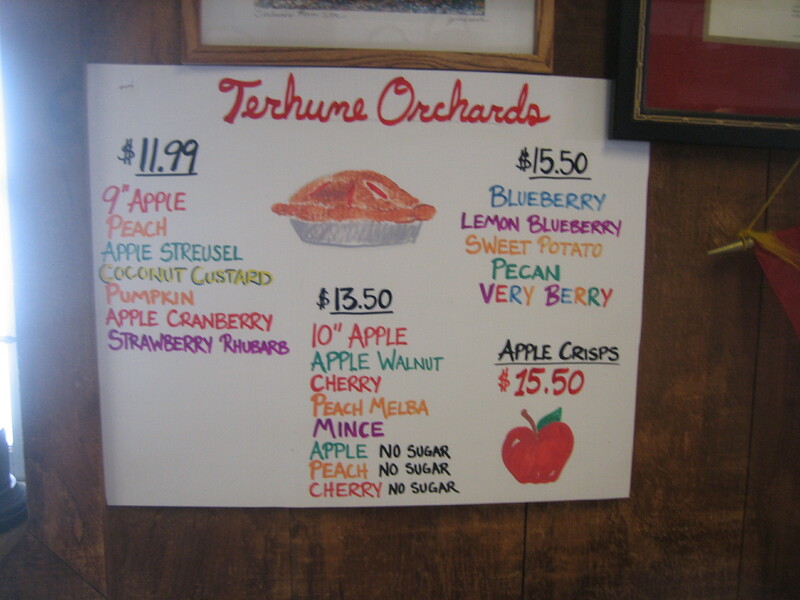 Others, like Terhune Orchards, are larger in scale with more employed workers and differentiated tasks that include more aggressive marketing. A pretty as a picture entrance welcomes you. 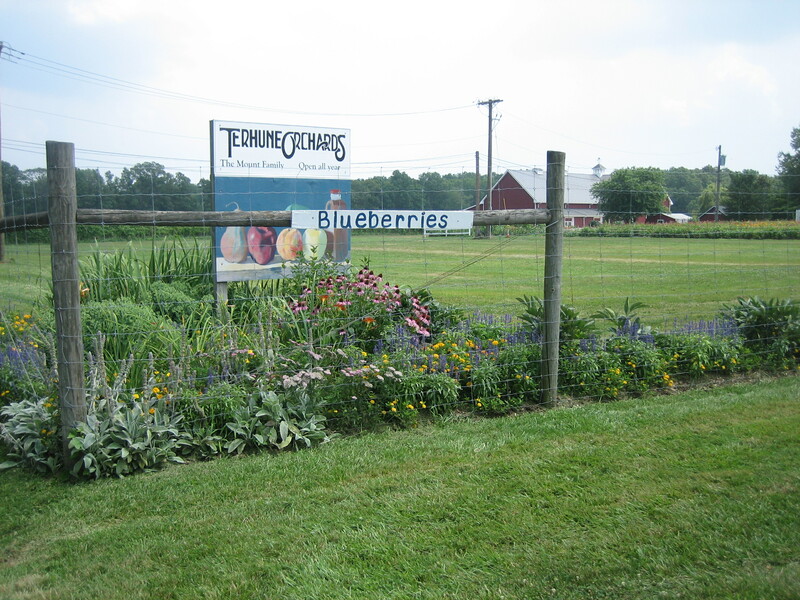 Terhune has an outpost in the Trenton Farmers Market, a large farm store at the farm — not simply a stand — a substantial website and even publishes a “newspaper” and regular recipes geared to its wide selection of seasonal produce. There is an area of the store dedicated to organic produce. It lead me to wonder what the opposite of organic produce is…inorganic? 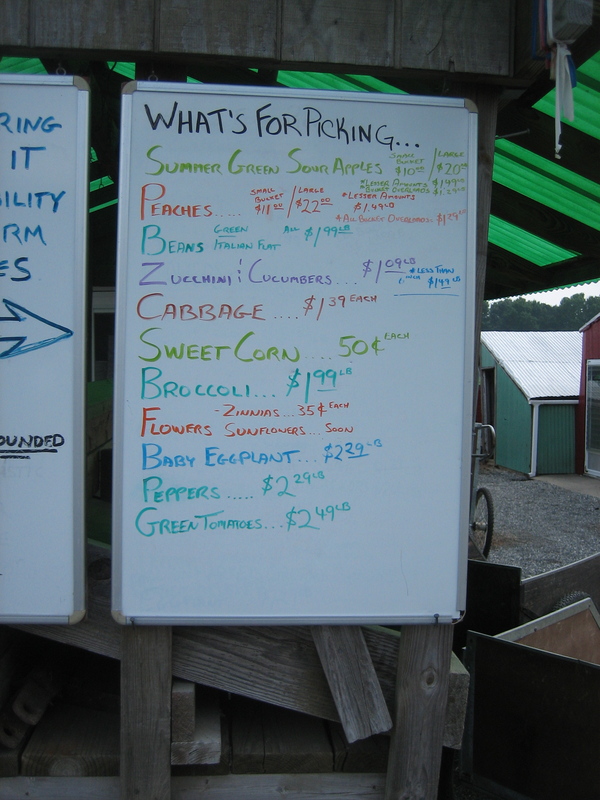 A sign shows the wide variety of fruit and produce that Terhune grows and when it’s available. 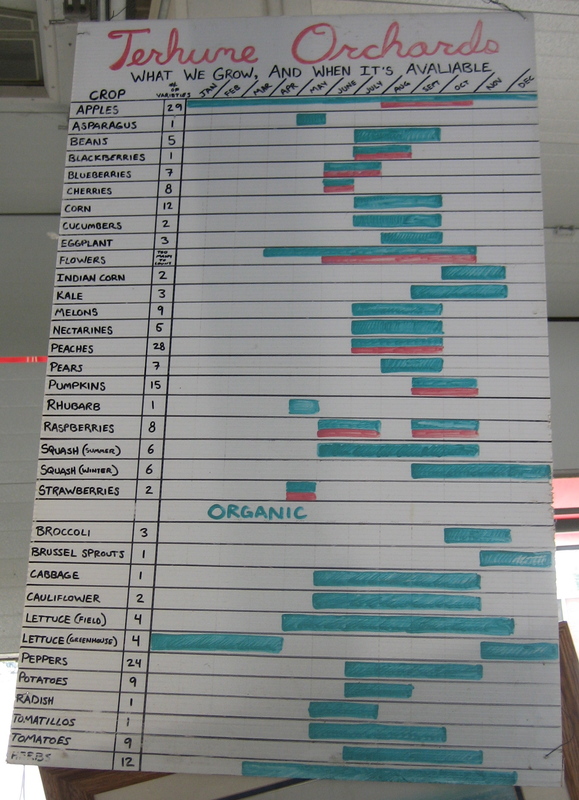 The red bars indicate when you can pick-your-own at the farm. 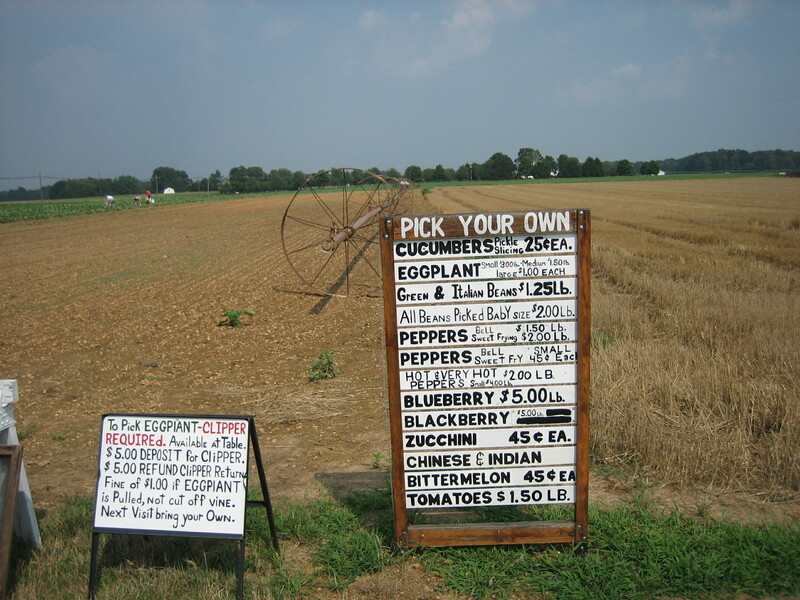 Pick-your-own was a feature of nearly every farm stand we visited. Zinnia’s summer rainbow of colors are as much a part of summer’s harvest as peaches and tomatoes. 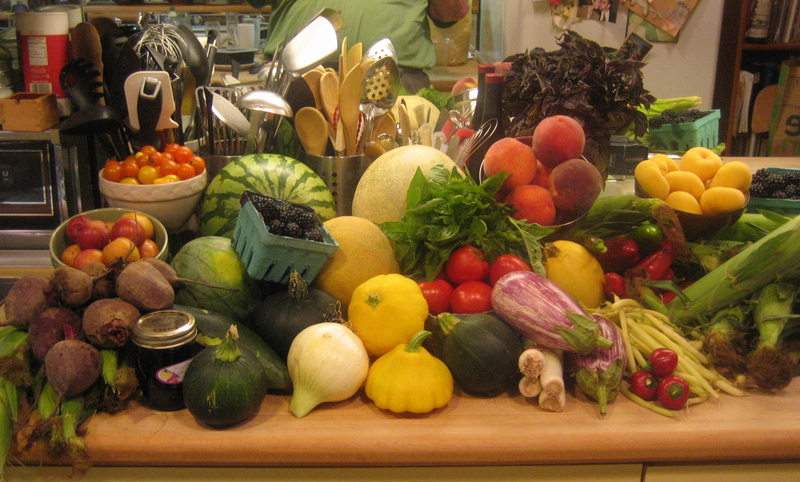 My goal in visiting farm stands is to find things that I cannot find at my local Whole Foods Market. At Terhune’s, these included fresh currants that I have combined with sugar to create a currant syrup to combine with seltzer for a fresh fruit spritzer. 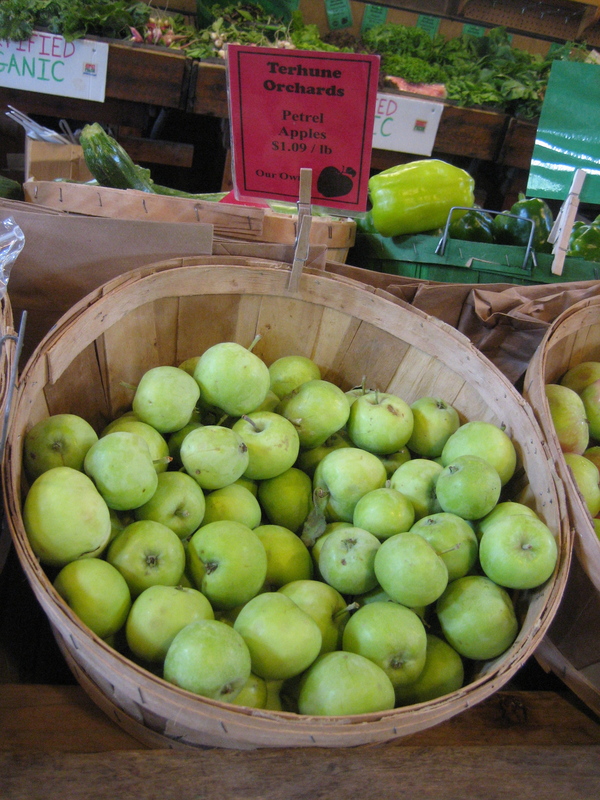 Petral apples, small sour and green, are Terhune’s first apples of the season. Mine went into a rice salad with almonds and shiso leaves. More about shiso leaves later in the blog. Since I’m not a baker, I love the sight of fresh-baked fruit pies — baked by someone else. 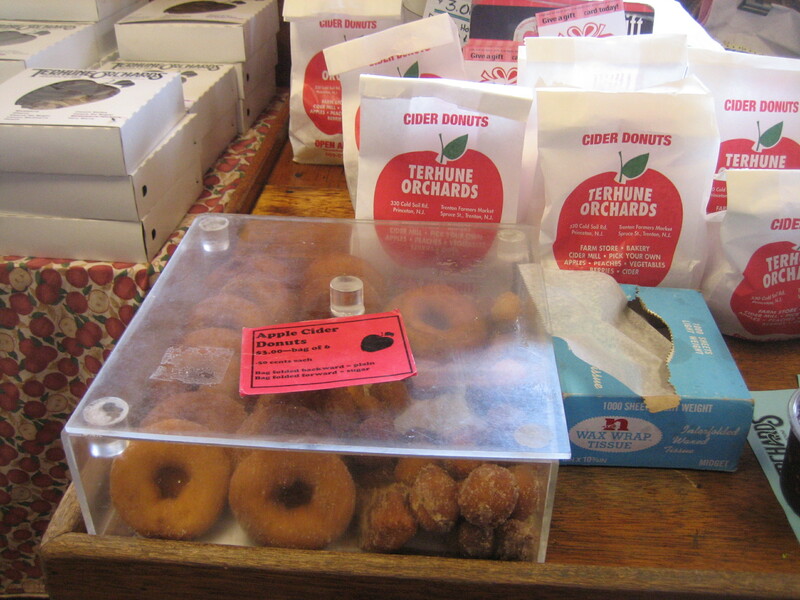 And it’s impossible to resist a cinnamon and sugar-coated cider doughnut. Well, apparently it is possible as Christina did resist. Maybe it’s just me? 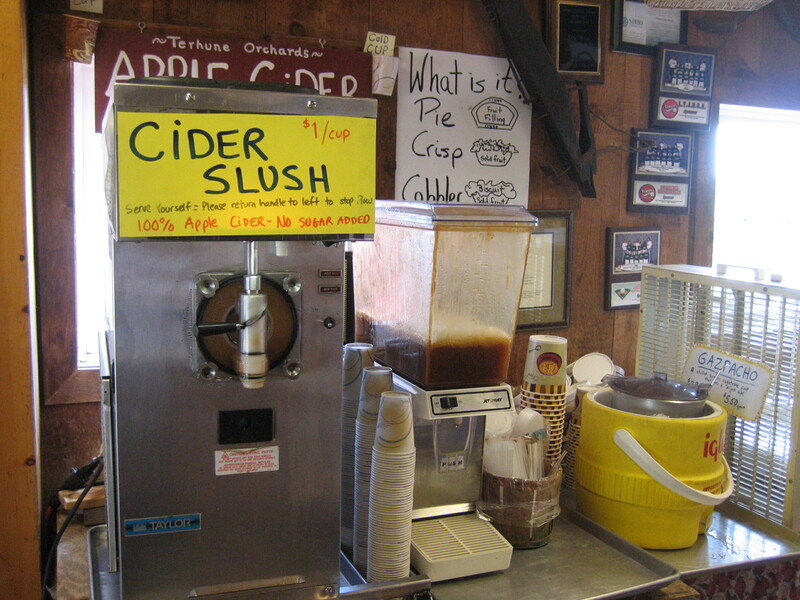 With the temperature in the mid-90’s, a frozen cider slush was an ideal summer cooler. Thanks to the generosity of a friend and former Mercer County denizen, I had already previewed Kerr’s sweet signature corn – dropped of at our apartment two weeks ago. It’s tiny first of the season kernels were now plump with sugar. Kerr’s stand was modest enclosure supplemented by a farm table. 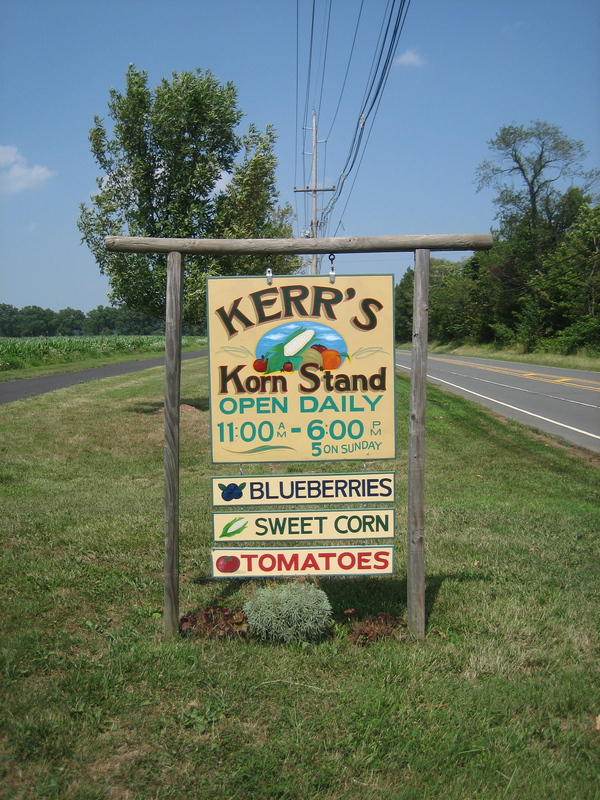 In addition to their own produce, Kerr’s offered Circle M Peaches from Salem County. Though Salem county is only about 75 miles south, Salem county’s peaches…and tomatoes arrive several weeks earlier than Mercer county’s. There are scores of tomato varieties. Here are Kerr’s first of the season, called July 4th because they are ready by Independence Day. Kerr’s was also my source of bell zucchini — a fat, round variety. I stuffed these with grape tomatoes and roasted them. Stuffing over-sized zucchini — common as summer progresses — is an excellent way to use large zucchini that have an unappetizing pulpy interior that benefits from being scraped away. A recipe for this will be forthcoming. 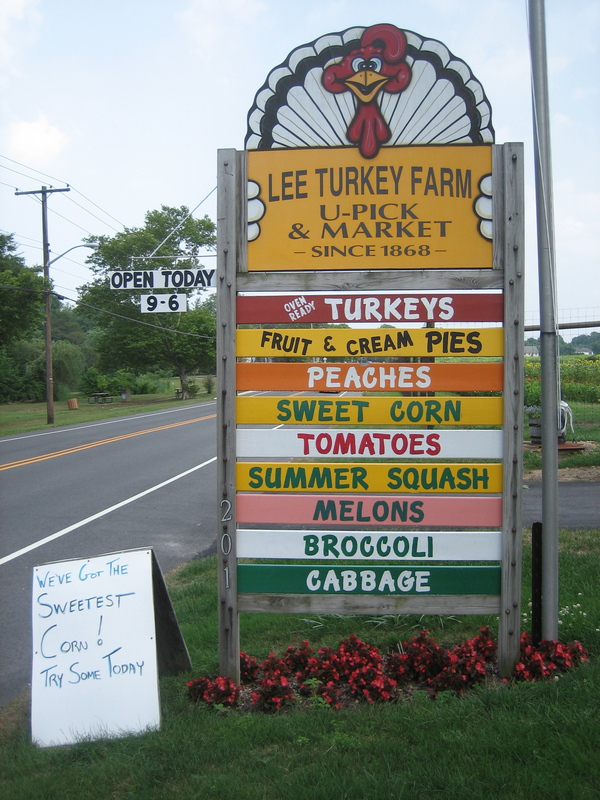 How did Lee”s Turkey Farm promise of the “sweetest” corn compare to Kerr’s? Despite buying a dozen ears from Kerr’s, I had to add four ears from Lee’s for an at-home “corn tasting.” Unlike Kerr’s white, Lee’s corn is yellow. 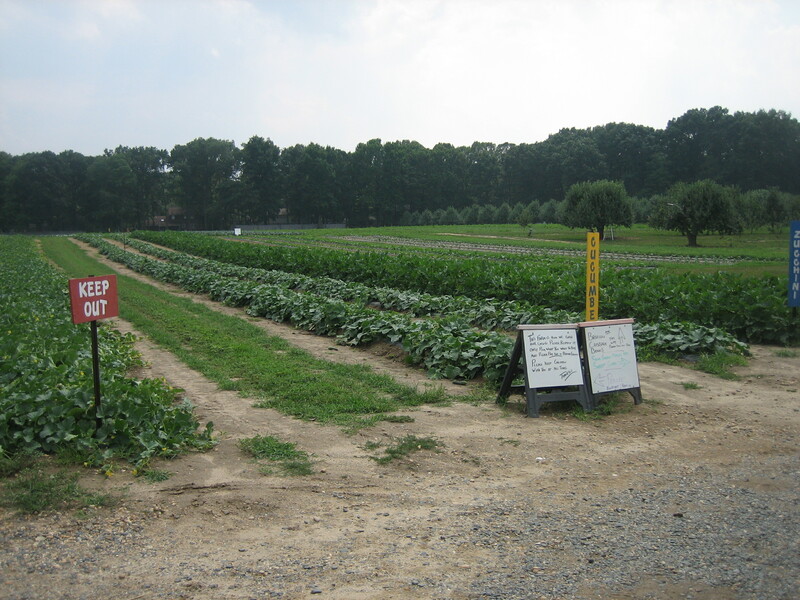 Though Lee’s farm goes back six generations, it holds the distinction of establishing New Jersey’s first “pick-your-own” option in 1964. Ronnie Lee is the sixth generation Lee. He works with his fifth generation dad and seventh generation children. Different farms — especially those that endure for generations — employ different strategies to extend their business and season. For Lee’s. it’s 3000 turkeys! 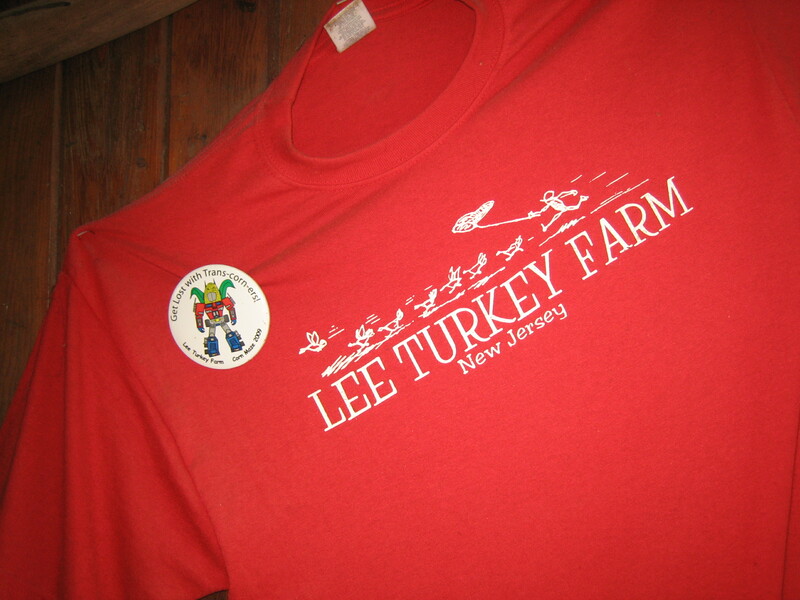 Lee’s sells 90% of its turkeys in November. I suggested to Ronnie that he promote his turkeys for summer grilling. When we provided the food services for Philadelphia’s Mann Center as we did for a decade of summers, turkey “flank steak” was a staple of our Bravo menu. With that, I found my farm stand recipe for this week. 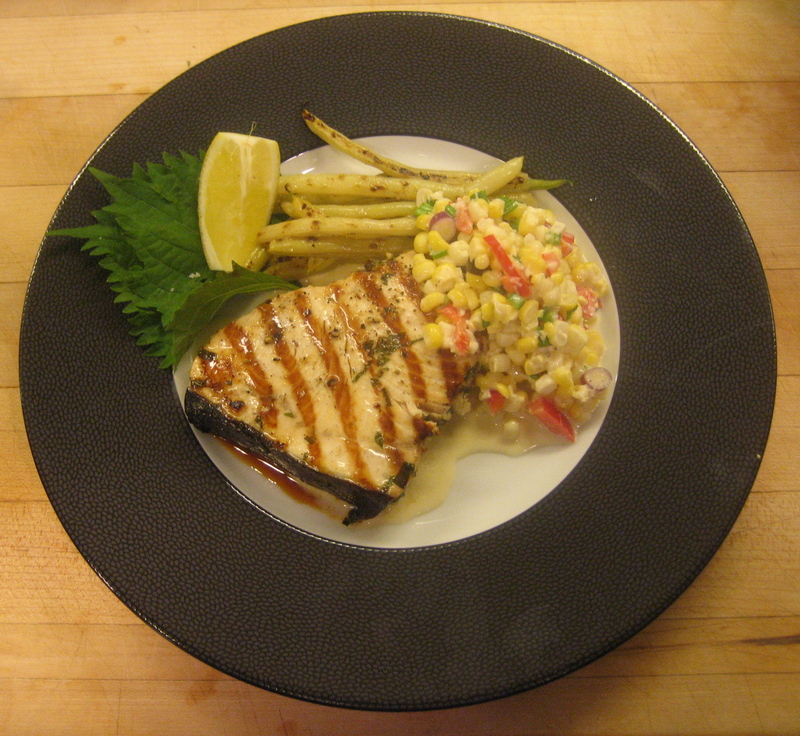 Look for Grilled Marinated Turkey “Flank Steak” with tomorrow’s blog. 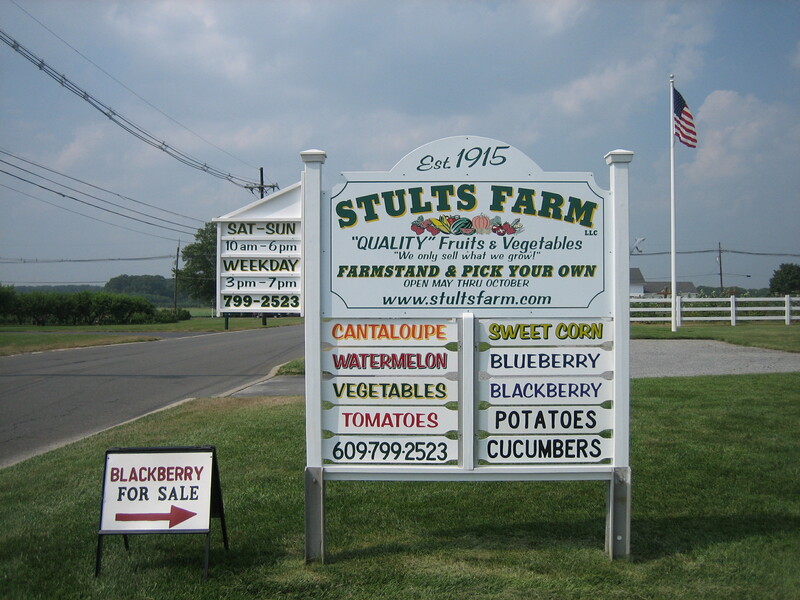 From the road, Stult’s Farm Stand looks as though a tornado had picked up a Lancaster county PA Dutch farm and plopped it down in Mercer county. This was primarily the result of the distinctive black carriages that marked the entrance to the stand. Many years ago, the great retailer and founder of Crate & Barrel, Gordon Segal taught me that the key to merchandising is massing and simplicity. (At Home book owners see page 363.) While the produce in the fields may have been outstanding, the produce displayed on the tables got the simplicity part but was missing the massing. Here’s Christina — not fully satisfied with Stult’s. 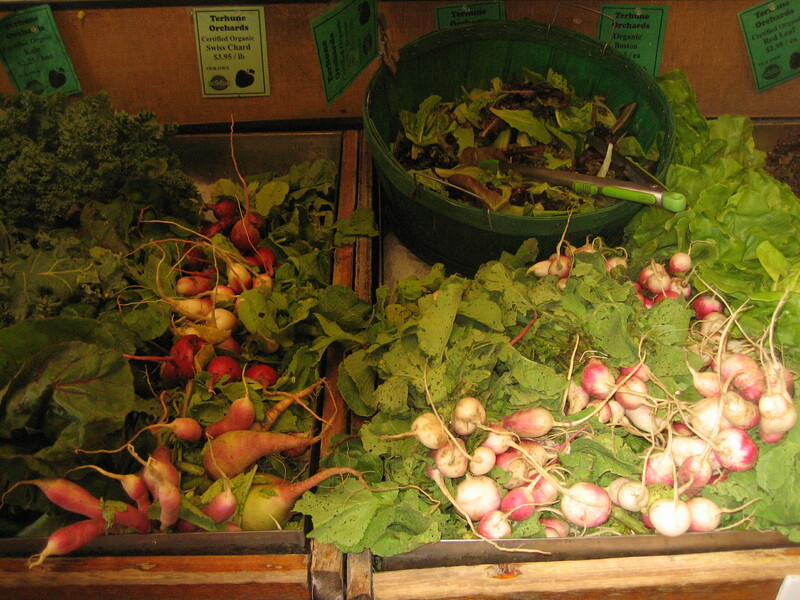 Z Food Farms has a small stand at my neighborhood Rittenhouse Square Saturday Farmers’ Market. I like it because they have produce that I don’t see at other stands. A few weeks ago it was tiny yellow wax beans — similar to haricot vert, and kohlrabi — a crisp cabbage-tasting vegetable perfect for a simple summer’s crudite. This past weekend I bought shiso leaves. Shiso is a leaf typically used to garnish sushi — usually bright green, heart shaped, with lots of little spikes around the edges. (If you should be lucky to get a shiso leaf with your sushi, wrap it around some shredded daikon — another familiar garnish, and dip it into your soy-wasabi. Yum.) It is one of my favorite flavors and a leaf rarely seen in markets. My first encounter with shiso was many years ago at Omen — a Japanese restaurant in Soho — that’s still around and still wonderful. A meal at Omen would not be complete without a bowl of shiso rice, steamed white rice scented with the distinctive anise flavor of the leaf. Over several weeks of visiting their stand on the Square, I learned from mom and dad “Z,” who manned the stand, that their son’s farm was in its first year. I decided that it should be included on my Mercer county tour. Though our GPS insisted that we had arrived at our entered address, Z Farm Foods was nowhere to be found. Undaunted, we circled back and forth until we discovered a sign-less location with nothing for sale. 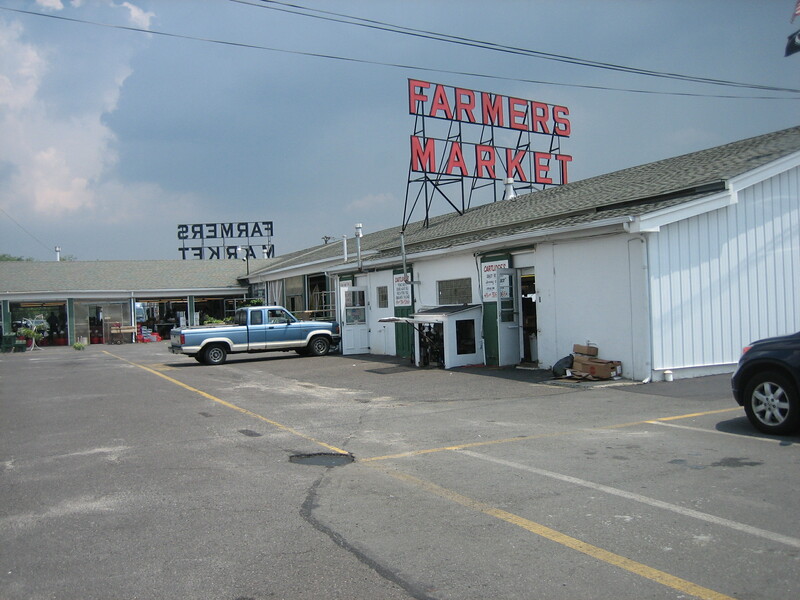 It was not until this past Saturday, when we reported our attempted visit to mom and dad, that we learned that for now, Z Farm Foods only operates it farm stand on Wednesday afternoons. 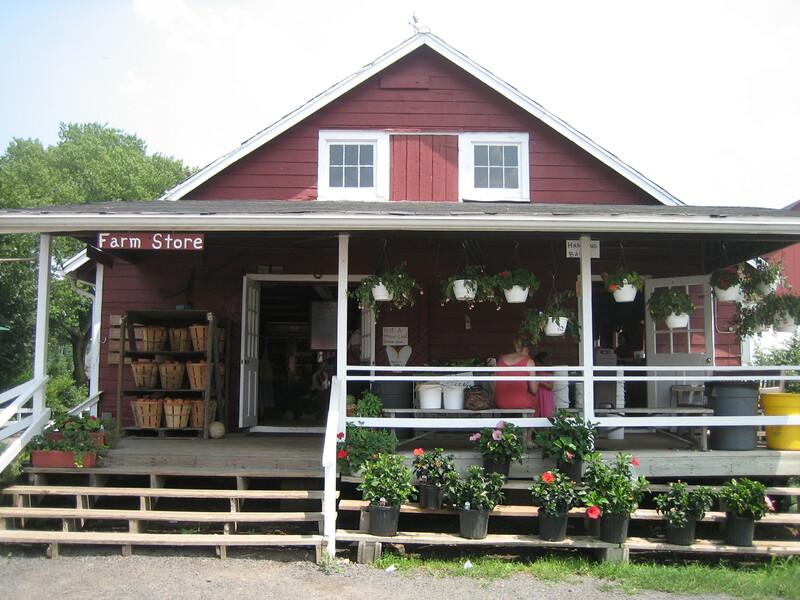 But, a new walk-in refrigerator is due this week that will enable Z Farm Foods to expand its farm stand hours. This past Saturday I did buy some of Z’s garlic that I used – thin slivered and not chopped — in my “What to do when you buy too many small tomatoes” Sauce. 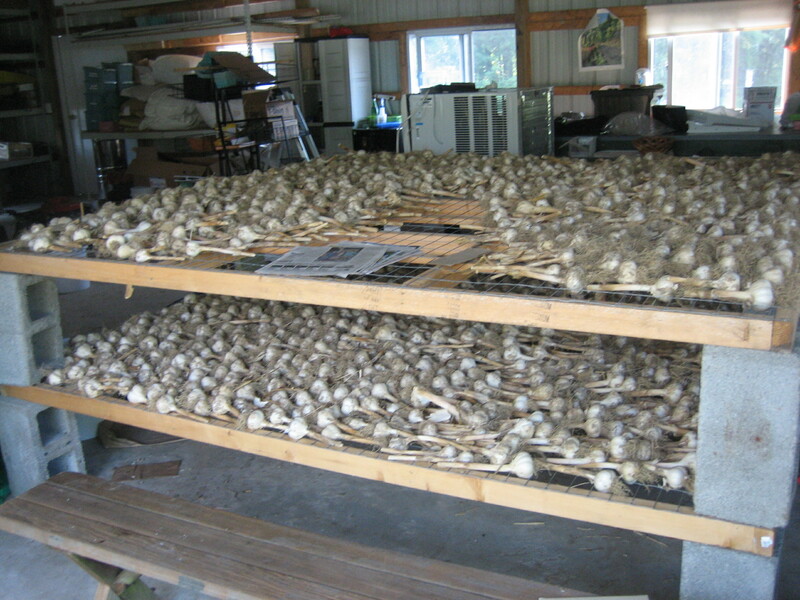 Z’s garlic is seen here curing at the farm. It’s a lot of garlic. But mom and dad say it will all be gone by fall. 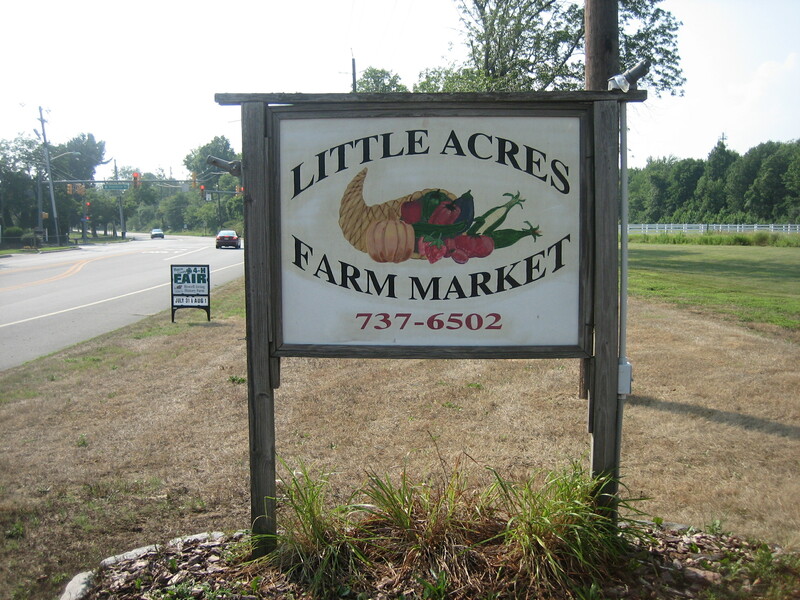 Little Acres was a modest and unassuming stand befitting it’s name. Half a watermelon — from Salem county and a local cantaloupe were added to our produce haul. In years past I despaired of local cantaloupes — always finding them tasteless and mealy. But I have had repeated good luck this year including at Little Acres. Along the road there were occasional no-name stands. Here down a narrow road. And the occasional unmanned stand operating on the honor system. As our day stretched into early evening and our car packed with produce, we decided it was too late and we were too tired to head home for dinner. 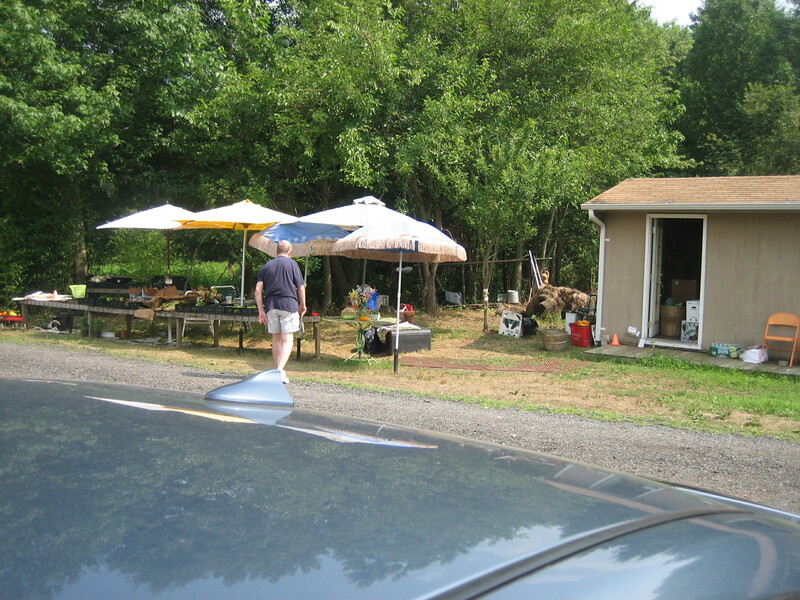 Instead, we headed for Lambertville, NJ — along the Delaware just north of Mercer county in Hunterdon county. There we met an old fellow restaurateur — Reed from Astral Plane, who was holding down the floor at the Hamilton Grill. Astral Plane, long a fixture on the 1700 block of Lombard Street and a veteran of the first Philadelphia restaurant renaissance, opened just a few months after Frog in 1973 and provided years of warm welcomes and fine dining — thanks to Reed. 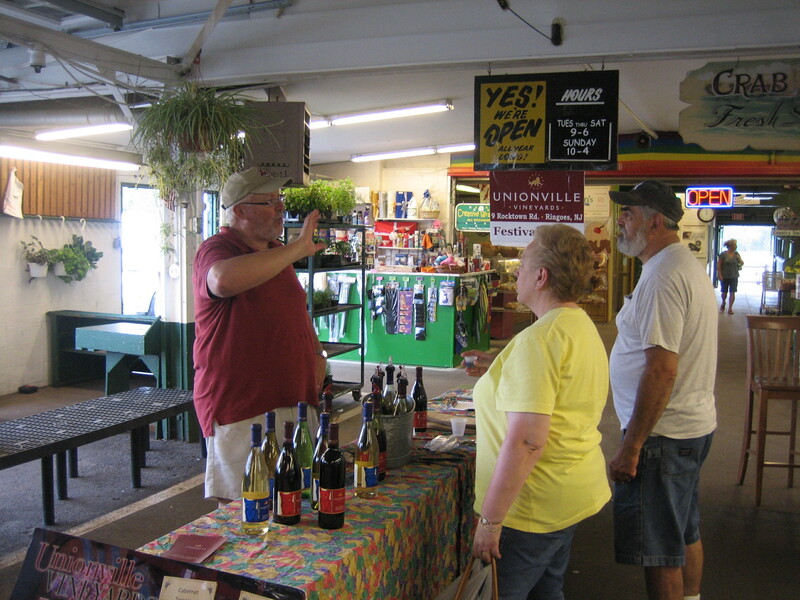 The Hamilton Grill is a BYO so be sure to stop at the Unionville Vineyards table at the Trenton Farmers Market. We were very glad we did as dinner without wine after such a nice day would have been a disappointment. Tip: Of course our white wine was not chilled — having been a passenger in our car for hours. The waiter stuck our wine in the freezer to get it chilled. FYI: The fastest was to chill a bottle of wine is to place it in an ice bath in an ice bucket — lots of ice plus enough water to surround the bottle fully, and then add lots of salt – regular table salt is fine — to create a brine — just like the old-fashioned way of making ice cream. The salt hastens the melting of the ice which has the effect of rapidly chilling the wine. 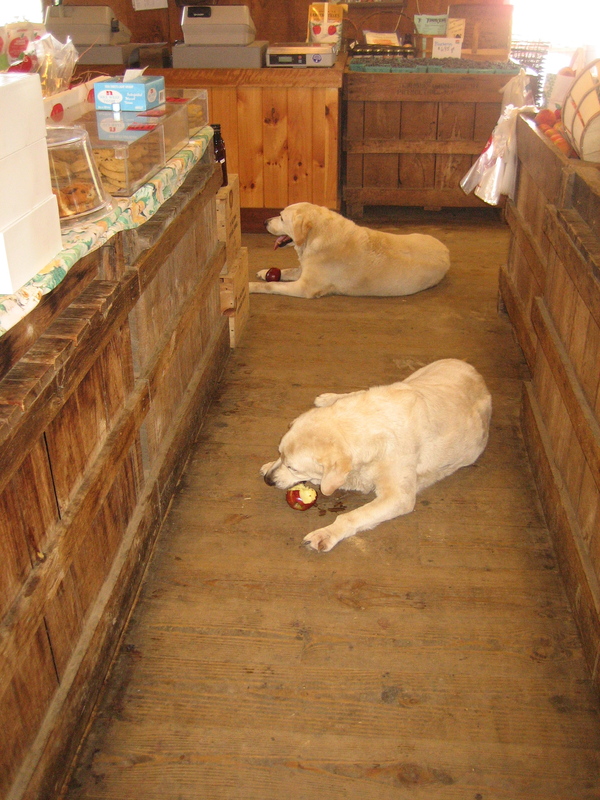 I’m like the kid in the candy store – except my candy is farm stand produce. Here is our day’s haul. From left to right: Grape tomatoes, radishes, Lee’s yellow corn hidden under the radishes, currants, watermelon, nectarines, doughnut peaches, bell zucchini, Lee’s boneless turkey breast, cantaloupe, onions, more grape tomatoes, Petral apples, Kerr’s white corn, and just off camera, Kerr’s 4th of July tomatoes. In the background, partially consumed Unionville Vineyard wines. All Jersey Fresh! 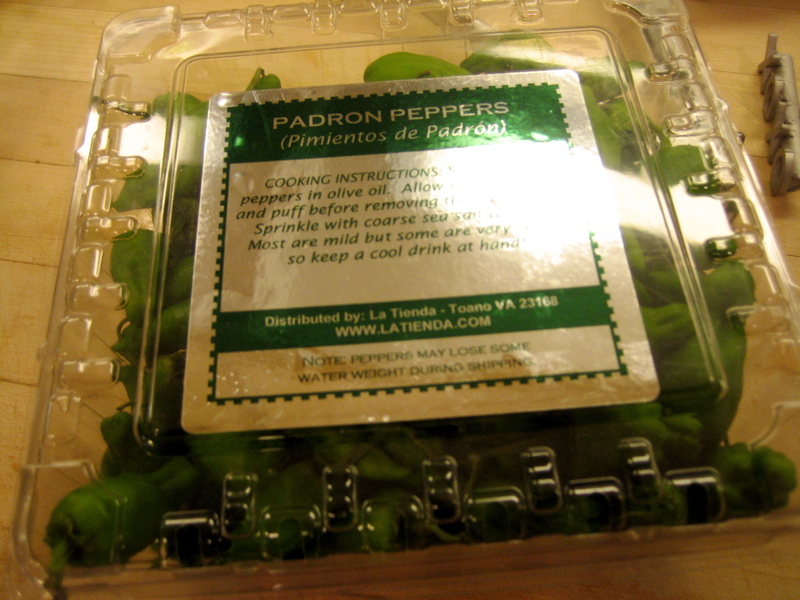 It’s Pimientos de Padron season. These amazing peppers, that I first discovered in Madrid a few years ago, are available in the United States for a short summer season. 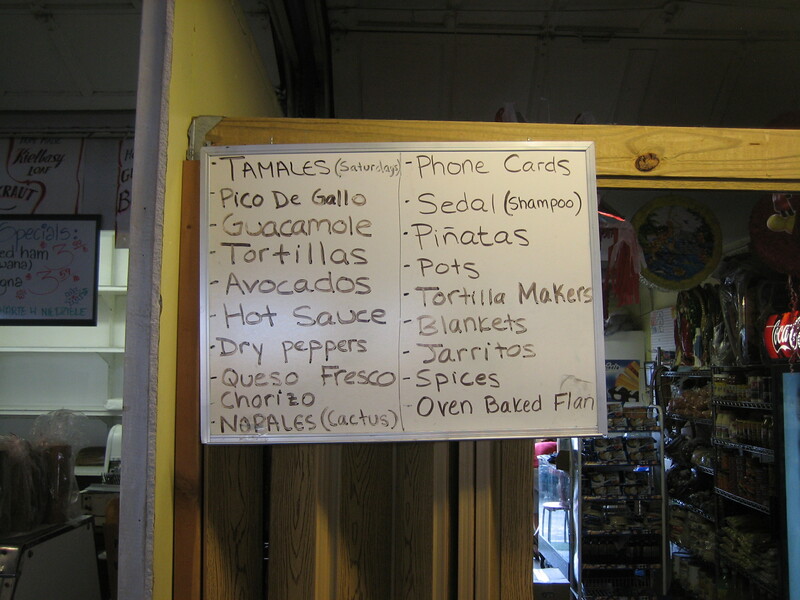 I bought mine via the internet from La Tienda, the site that specializes in Spanish and Latin foods. Here’s the link to last summer’s blog about these little devils along with a recipe. I strongly suggest ordering a pound or two – a pound will easily serve four, buying some very good bread, lots of beer, some excellent cheese and watermelon and inviting friends and family over for an easy dinner they will not forget. An alternative to cold beer is iced sangria. See At Home page 51 for my Sangria recipe. 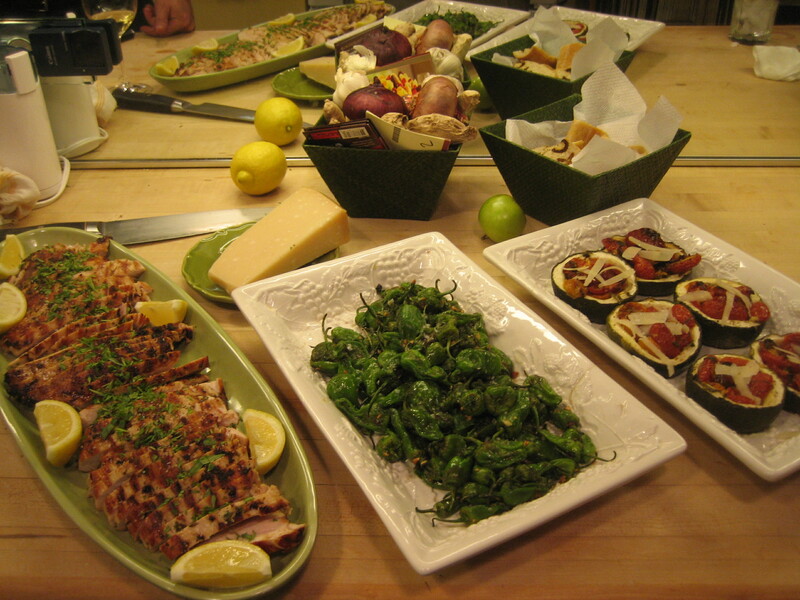 Pimientos de Padron were the centerpiece of a recent dinner at home with Christina and Noah — along with Turkey “Flank Steak” and Roasted Grape Tomato Stuffed Zucchini. Next week I head south and west of Philadelphia. I hope sharing these experiences encourages you to take to the road to visit farm stands or, at least, to visit your local farmers market and enjoy this bountiful harvest with friends and family…At Home. Reminder that all of At Home’s blog recipes are available on the blog site — accessed through the recipe index. Please pass along to others who you think would enjoy going along On the Road. Note: This is the fifth post in a series. If you missed Part 1: A Conversation with Myself, click here. 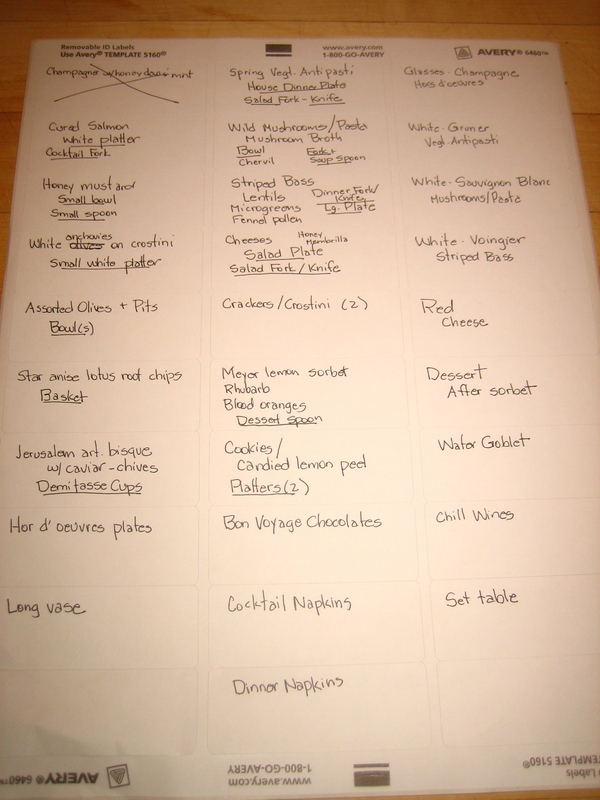 For Part 2: Party Parameters and Menu Planning, click here. For Part 3: Organizing Tasks & Time, click here. Part 4: Shopping, click here. All is well. I have planned well and spread my tasks over time. It’s been a pleasure and not a chore. Only a little bit of work remains and my one relaxed hour before guests arrive is within my grasp. My Friday shopping did not start so well. I rushed out of the house without my carefully crafted shopping list. I stopped and made a new list as I ran through my dinner menu in my head. Friday’s Reading Terminal Shopping was a pleasure. My first stop was Fair Food. I had a general idea as to what would be included in my Spring Vegetable Antipasti — but open to unexpected discoveries. Fair Food had beautiful fiddlehead ferns, ramps (wild spring onions), rainbow chard and asparagus — all just-picked and grown within a stone’s throw of Philadelphia. Red scallions will be added to the French lentil salad. I picked up fresh sorrel for the sorrel mayonnaise I planned for the anitipasti. Fair Food also had beautiful Jerusalem artichokes (aka Sunchokes) that I picked up for my missing hors d’oeuvres — a cold, creamy white soup topped with caviar. A blog reader had let me know that Livengood’s was no longer at Reading Terminal Market and directed me to a wonderful website called Local Harvest. 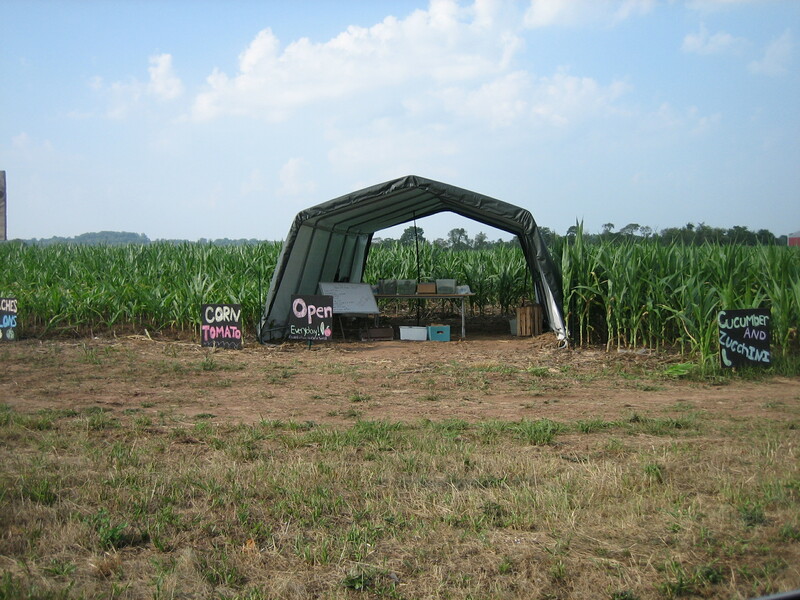 For information about where Livengood’s organic produce will be available, click here. Thank you Ken. I found an abundance of wild mushrooms at Iovine Brothers — beautiful morels, honeycups and hens in the woods. These were supplemented by the gift of maitakes from a dear visiting friend who is a blog reader and knew of my quest for wild mushrooms. She also brought beautiful edible nasturtium blossoms that I will use with my Spring Vegetable Antipasti. My regular fish stand was out of striped bass, but I found plenty at another stand. At DiBruno’s I switched pastas from pappardelle to malfadine. I thought this narrower but still ample pasta would be easier to eat with the wild mushrooms. Picked up some crackers for cheese, Spanish white anchovies and caviar for my hors d’oeuvres soup. Saturday morning I walked across Rittenhouse Square to the farm stands that line Walnut Street. It was a perfect spring day with a deep blue cloudless sky and azaleas in full bloom. My mission was to buy local cheeses for our cheese course. 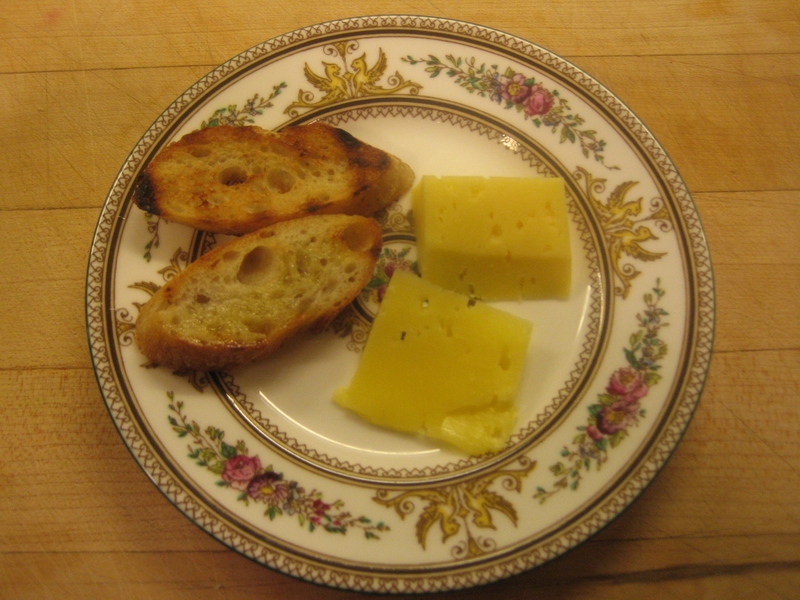 Cherry Grove Farm from Lawrenceville, New Jersey makes organic cheeses from their own grass-fed cows. I picked an “asiago,” a toma and a blue. I wanted a fresh goat cheese, but the neighboring stand only could offer a goat gouda. 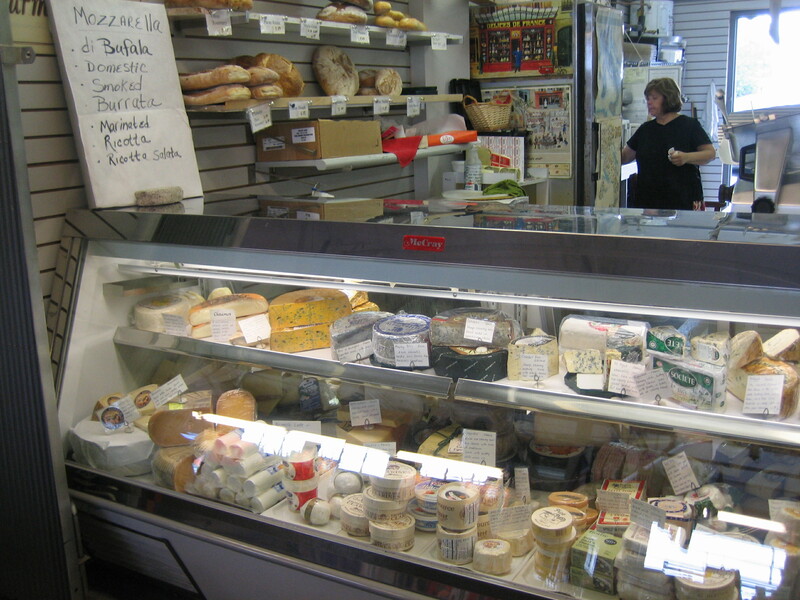 At DiBruno’s I found a fresh goat cheese from Shellbark Farm in West Chester. Cheese course complete. I also picked up wonderful fresh lilacs, apple blossoms, sweet peas and nameless yellow and blue flowers from the Amish farm stand. 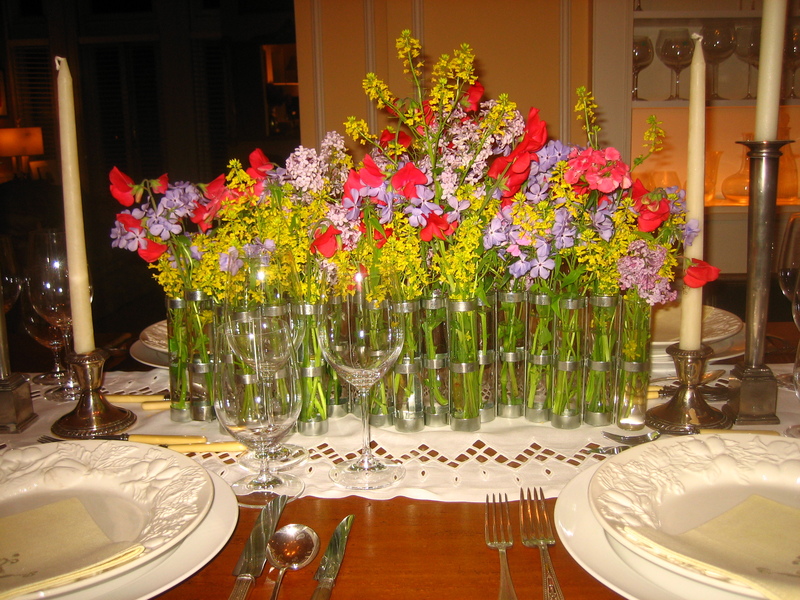 I love arranging flowers. I think of it as a cross between painting and sculpture. I don’t know about you, but I rarely have luck with honeydews. I find that if you don’t find a ripe honeydew, hell may freeze over before an unripe honeydew ripens. Fortunately, I found a ripe honeydew last Saturday at Whole Foods. Unfortunately, it had no flavor. At Reading Terminal Market I found another, pre-peeled and in a plastic bag for 99 cents. Once again, not much flavor — but marginally better than the first. With a little mint syrup mixed with champagne it will be good enough. My little local produce market is Sue’s on 18th Street between Sansom and Chestnut. Family-owned and well-priced, it is a welcome alternative to Whole Foods and Rittenhouse Market. Among the things I love about Sue’s are the $1 packets of fresh herbs. I only use fresh herbs, but nearly all markets sell expensive packs of herbs that provide much more than you can use before the herbs gets too old. Sue’s breaks down the large packets into small $1 packets that provides plenty of herbs for a meal or two. Sue’s also had nice looking Sicilian blood oranges — not exactly local, but a nice addition to dessert. I ordered fennel pollen on Monday from Chefshop.com. Standard shipping. I just assumed it would get here by Friday. By mid-day Friday I started wondering where it was? I went to the email and tracking number and lo and behold, not due until Monday!!! That’s right, Monday. Not good for a Sunday dinner. A touch panicked, I called Chefshop.com who confirmed 1) it was not due until Monday and 2) it had not even arrived in Pennsylvania. It turns out that Chefshop.com ships from Redmond, Washington and my assumption about when it would arrive was profoundly wrong. It seemed my only option — if available — was to ship it overnight, Saturday delivery with a shipping cost of $55. Overhearing this, Christina said I should try our neighborhood DiBruno’s. I said, with a man’s confidence, that DiBruno’s did not carry it. They did not even show it on their website. (This is the shopping version of real men don’t ask directions when lost!) Ignoring me, Christina called DiBruno’s. Sure enough, they had it…just as I suspected. Thank you Christina. Step 5 in my Plan to Entertain is Organizing Space. A critical early task is to clean out your refrigerator to make room for what is likely to be something than its normal line-up. By dinnertime on Sunday, my counters will be clear of everything but what I need to turn-out our dinner. That will include an empty dishwasher and dish rack. Next to my sink I will have a bus pan (like you find in restaurants) and small plastic tub filled with soapy water for flatware. My sink will be empty and I will keep it empty because I know that once my sink is full, I’m sunk. Step 6: Setting the Table provides suggestions and tools to get your table together including a Setting the Table Worksheet. My preference is to use re-positionable labels. 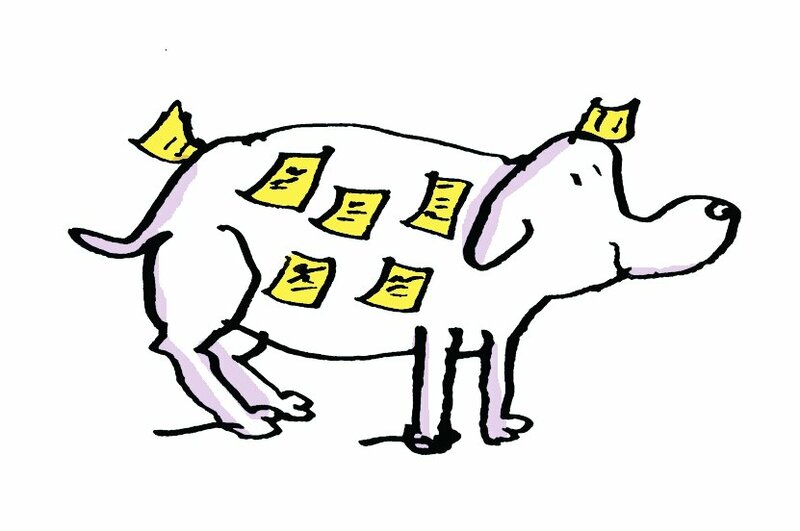 See At Home Page 12 for more about re-positionable labels. As I watched the Phillies loose to the Diamondbacks on Friday night, I created my re-positionable labels for setting the table. On Saturday Christina used these to pull, pile and label everything we needed to serve our guests with a need for only the occasional menu question. It seems as though Christina has worked hard getting our apartment together. I know she enjoys entertaining and likes an excuse to get things organized, but I hope she has found this to be a pleasure and not a chore. By Friday mid-day my shopping was well in hand. My plan was to do prep work on Saturday, but I was more in the mood to cook than go back to my desk. Doing my prep work on Friday would make for an even more relaxed Saturday than I had planned. So I trimmed the mushrooms and finished the mushroom broth, portioned the striped bass, pureed the honeydew, made the Jerusalem artichoke soup, cooked and peeled the fava beans, made the sorrel mayonnaise and figured out my rhubarb relish. I had to resolve what to do with my rhubarb. The rhubarb had been macerating in sugar since last Sunday creating a pinkish syrup. I love the crunch of raw rhubarb and despair of cooking it. But I I had never seen it used un-cooked — something about not eating raw rhubarb. I had nibbled on quite a bit and I seemed none the worse. 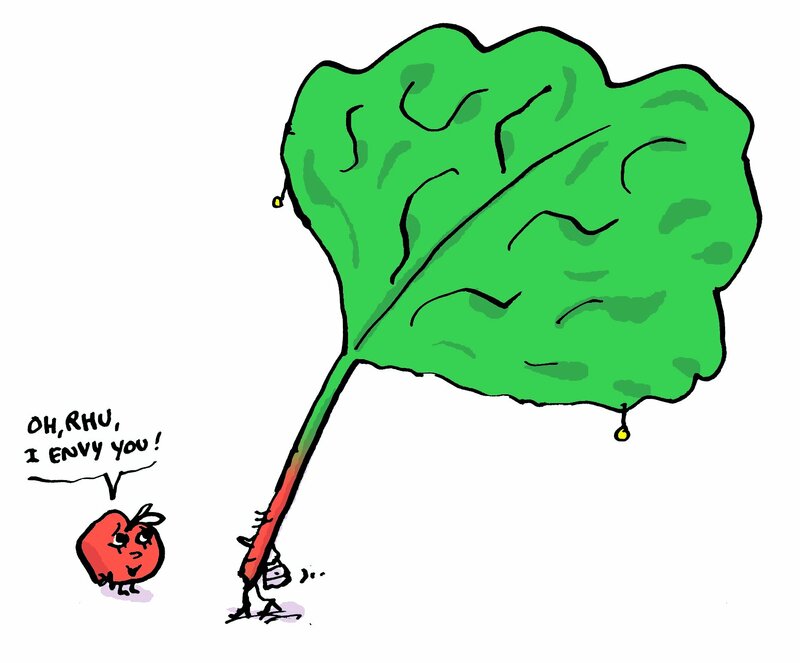 Some internet research revealed that the prohibition extended only to rhubarb’s leaves and roots. I strained the rhubarb-infused syrup, added a few sprigs of rosemary and reduced my two cups to one cup of a fragrant syrup. After allowing the syrup to cool fully, I poured in over my rhubarb. 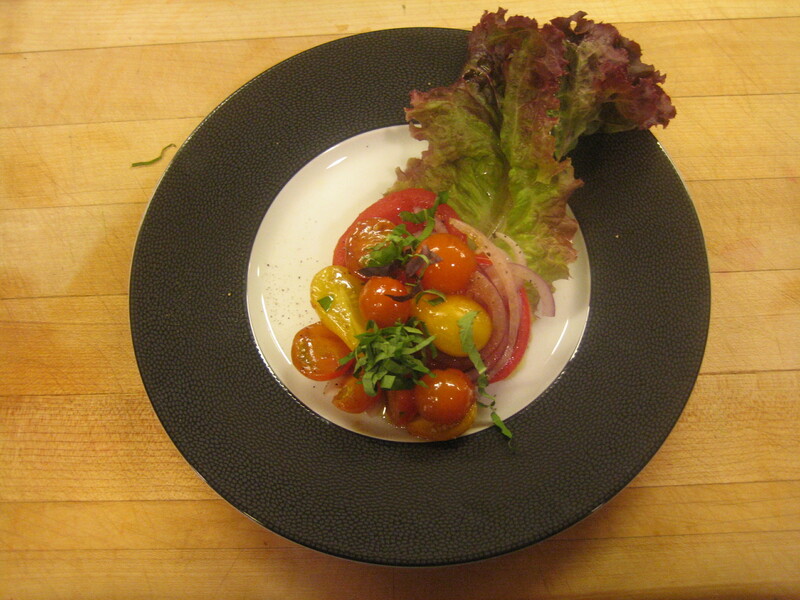 Now I have my relish to serve with the Meyer lemon sorbet. Rhubarb relish retains the crunchy character of raw rhubarb and is perfumed with rosemary. It’s the perfect complement to a citrus sorbet or vanilla or strawberry ice cream. Do Ahead May be made up to one week in advance. 1 Cut rhubarb into long, thin strips and 1/4-3/8 thick. Line up strips and cut across creating little cubes. 2 Combine rhubarb cubes and sugar in bowl and mix well. Allow to macerate for 24 to 48 hours, stirring occasionally to make sure all sugar melts into syrup. 3 Strain syrup and reserve. You should have about 2 cups syrup. Return rhubarb to refrigerator. Place syrup and a few springs rosemary in small pot and cook over moderate heat until reduced by half to about 1 cup. Strain rosemary from syrup. When syrup is cool, pour over rhubarb and mix well. My tasks today are primarily getting the Spring Vegetable Antipasti together plus a few other pre-dinner odds and ends. The antipasti is designed to be a celebration of our local harvest — seasonal cooking that reminds us of our place and time. This will will include baby artichokes, wild ramps, fava beans, fiddlehead ferns, rainbow chard, asparagus and beets (more homage to winter past than spring present, but some needed color). These wonderful vegetables are best left to “day-of” preparation. I have arranged for a helper from Frog Commissary to assist in serving. Before dinner I will group the elements of each course together on the kitchen counters. I will have posted my menu and my re-positionable labels with my final tasks and reminders. I will post a sign reminding myself to “KEEP PORTIONS SMALL” as we have lots to enjoy. And enjoy has what I have done so far. On Tuesday — my day job permitting — you can read about whether I ended up getting my one relaxed hour and how the evening went including photos. More importantly, I will share with you the central lesson of Company’s Coming. I know posts have been coming hot and heavy with an unusual number of pretty long blogs over an unusual few days. I hope you have enjoyed reading them and how to do More Parties. Better. Easier. After a break of several days, I will post Don’t Try This At Home, a behind the scenes look at Frog Commissary’s catering The Franklin Institute Awards dinner this Thursday where the guest of honor will be Bill Gates. REMINDER: If you plan to order At Home’s Mother’s Day Special, Mother’s Day is only two weeks away and you need to order in time to allow for shipping. Note: This is the fourth post in a series. If you missed Part 1: A Conversation with Myself, click here. 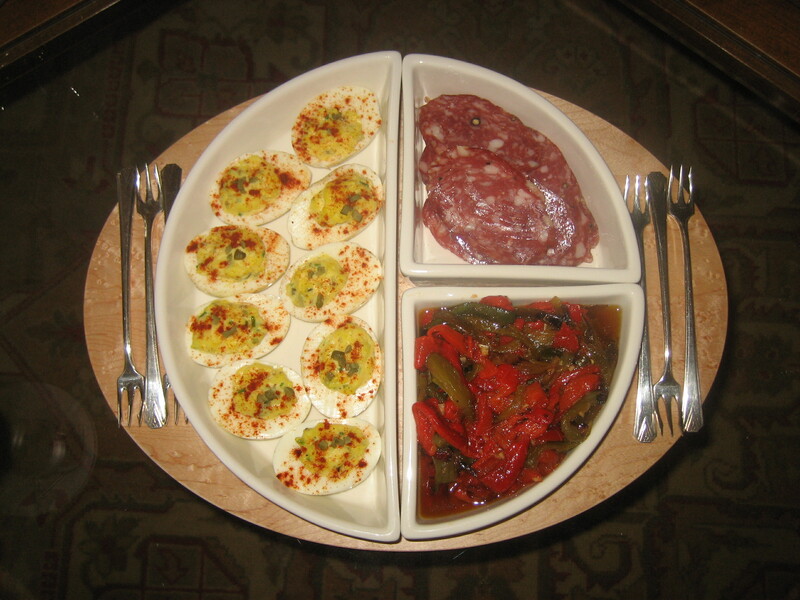 For Part 2: Party Parameters and Menu Planning, click here. For Part 3: Organizing Tasks & Time, click here. So far, so good. But it’s still early in the game. I feel confident in my game plan, but the game is really just starting. What’s important is that I feel focused on making this fun…for me. Plan to Entertain’s Step 4 is Shopping. On Sunday I filled out the At Home Shopping List based upon my menu plan. I had my “what” shopping plan. With At Home’s Organizing Tasks & Time Schedule, I had my “where and when” shopping plan. Last Saturday I did a little “pre-shopping” — and picked up bread for crostini on Tuesday. Thursday I will do a little light neighborhood shopping for a few things I want to do on Thursday evening. My preference would to have done this on Wednesday, but I had the opportunity to have dinner with a friend I only see rarely so I changed my plan. A sub-principle of planning is to be flexible. Friday My day for fun shopping at Reading Terminal Market. Saturday More fun at the Rittenhouse Square Farmers Market for cheese, flowers and maybe a little last minute inspiration. There are several ways to look at food shopping. Shopping can be purely functional. You’ve got your list…milk, check…eggs, check…coffee, check. You’re on a tight schedule, you’re in, you’re out…done. Task completed, check. I concede that with good reason, in our busy and over-committed lives, this is how we do most of our food shopping. In fact, for much of what we shop for, this works just fine. However, not all food shopping need be the same. I invite you to look at some food shopping differently..shopping with more foreplay! It has to do with enjoying the journey and not rushing to the destination. Enjoy exploring what’s seasonally new in the produce aisles. Rhubarb and local asparagus are as sure a sign of spring as the daffodil and robin. Shad roe has just appeared in markets — the annual evidence of shad’s life force. Shopping slowly extends beyond fresh food. Buying dried pasta? Explore its origin. Honey? There are now honeys available with all manner of natural flavor accents — the result of where the honey is from and where and on what bees fed. I remember, as a teacher many years ago at the Green Tree School (See At Home Page 69: The Green Tree Cafe), using food shopping to teach learning-challenged inner-city children that bacon does not simply come from the supermarket, but from pigs and some is smoked and some is not and pigs are raised on farms. 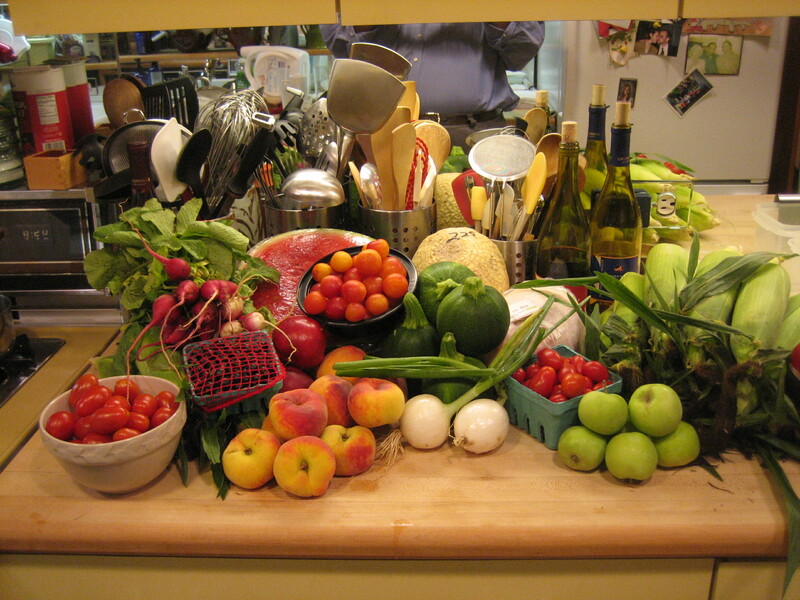 Food is the result of farm and farmer, ranch and rancher, fish and fisherman. Food is not just “there.” Food goes through a journey to get there and that journey is “contained” in the food itself…if you just stop to think about it. Do your functional shopping wherever, but occasionally seek out better markets and farm stands and shop slowly and for fun. Which brings me to The Reading Terminal Market. The Reading Terminal Market is my favorite place in Philadelphia. This extends from the wonderful prepared foods your can buy — no better lunch options in the city — to the fresh fish, meat and produce. Strolling the aisles for me is akin to wandering the galleries of the Philadelphia Museum of Art. My principal objectives on Friday will be seasonal local vegetables. There are two stands in particular that I will visit. One is the Fair Food Farmstand. Fair Food is formerly a program of White Dog Community Enterprises — a program to focus community support of and access to local farm products. See www.fairfoodphilly.org. 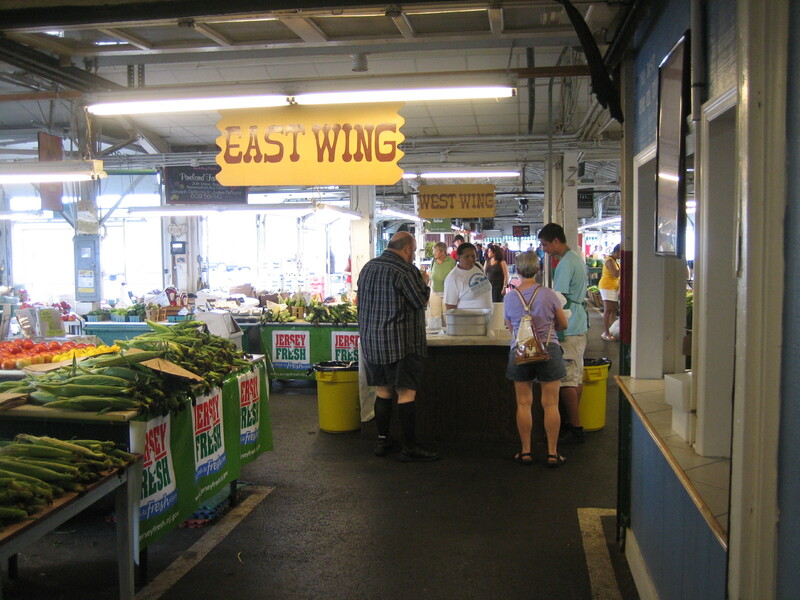 It is centrally located along the 12th Street perimeter of the market. 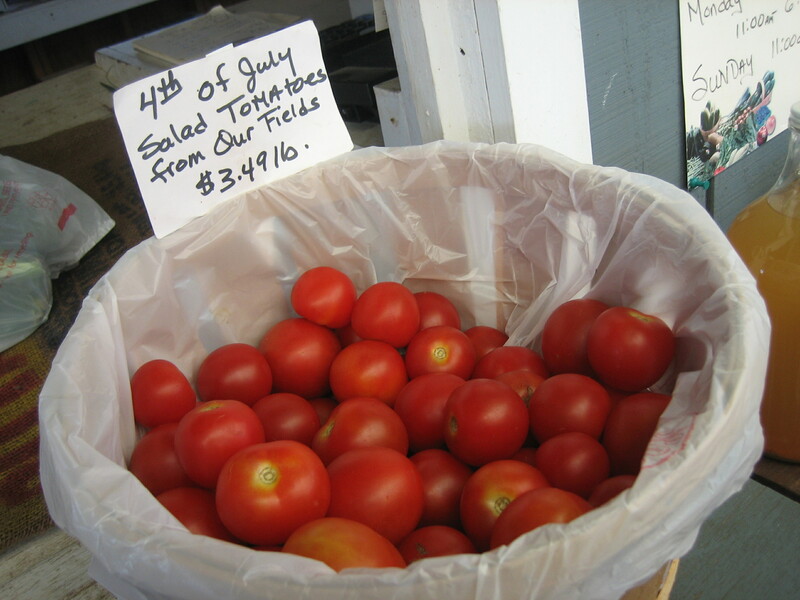 The other produce stand specializing in local produce is Livengood’s Produce, located in the center of the market. Here are some notes about some interesting ingredients I am using for our dinner. I will use the fennel pollen to coat my striped bass before searing and maybe sprinkle a little fennel pollen “dust” on the entrée plate as a garnish. Meyer lemons are a cross between a lemon and Mandarin orange. They are more round than a lemon and more oval than an orange. Correspondingly, their flavor is a cross between the two – sweeter and a lemon, more sour than an orange. Same thing with color – pale orange to deep yellow. Meyer lemon produces a sorbet with a distinctive flavor that results in the crossing of a lemon and mandarin orange. 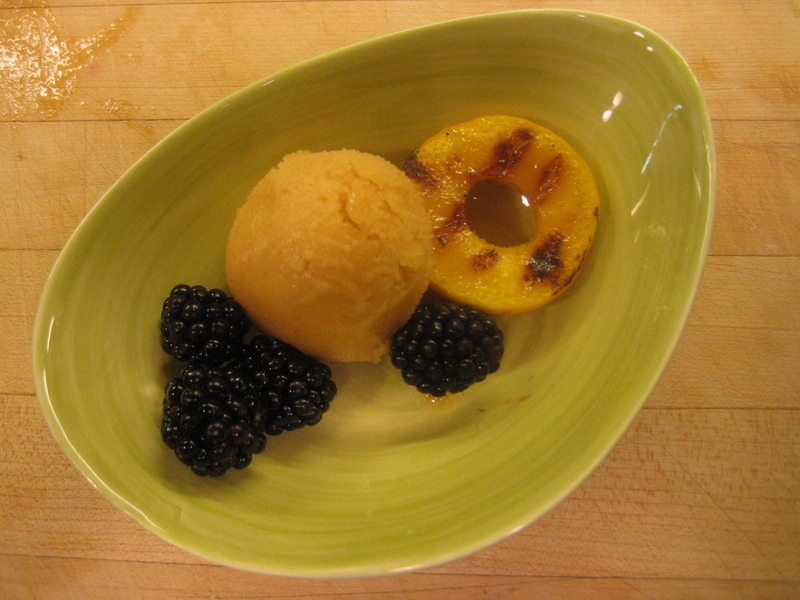 Remember to remove sorbet and other frozen desserts from freezer ahead of time to allow to temper and soften a bit. Do ahead Must be made at least one day ahead and as much as two weeks ahead stored tightly covered in freezer. 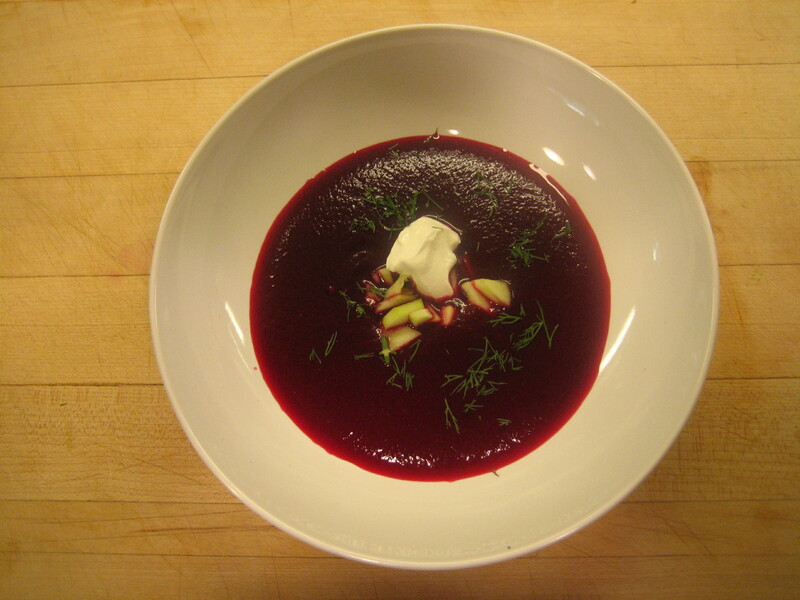 You may pre-scoop portions and hold in freezer to speed the process of serving. Combine Meyer lemon juice, simple syrup and Meyer lemon rind. Chill. Transfer to ice cream maker and freeze according to manufacture’s directions. 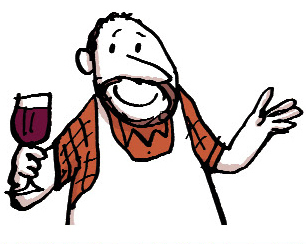 Start by getting a sense of what style/type of wine you would like to serve based on your menu. 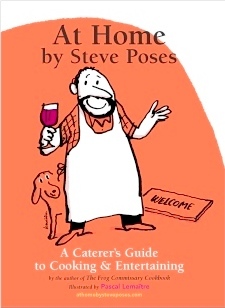 (At Home includes two terrific wine charts on Pages 32 and 33 than can help you.) If you are planning for a single wine for your dinner it should be paired with your entrée with some consideration given to what comes before. More interesting than doing one wine with a three course dinner would be to do one wine with your first course and another with your entrée. You will probably spend about the same — for example, two of the same bottles or one each of two different wines — two bottles. Rely on the store personnel to the degree that you can. Some Pennsylvania State Stores are better than others and they have all made great strides since the State Store dark ages. New Jersey is blessed with numbers of excellent wine sources including Canal’s and Moore Brothers. Moore Brothers is especially good for high value uncommon wines. Unless you are dealing with a wine store with extensive variety, it makes no sense going into the store with a specific winery and/or year in mind. The chances the store will have that particular wine are slim. They know their wines best. Give them a per bottle budget, let them know what you are serving, what you think you came in for, and trust them. You really have little choice other than making your own best guess. And they want you to be happy so you will return. Spring Vegetable Antipasti — Gruner Leltliner, a medium dry Austrian white wine. We bought two bottles each of the Gruner, Sauvignon Blanc and Viognier, but it is unlikely we will need two. A bottle of wine typically yields five glasses, but with all this wine six per bottle seems fine – one slightly small glass for each guest. 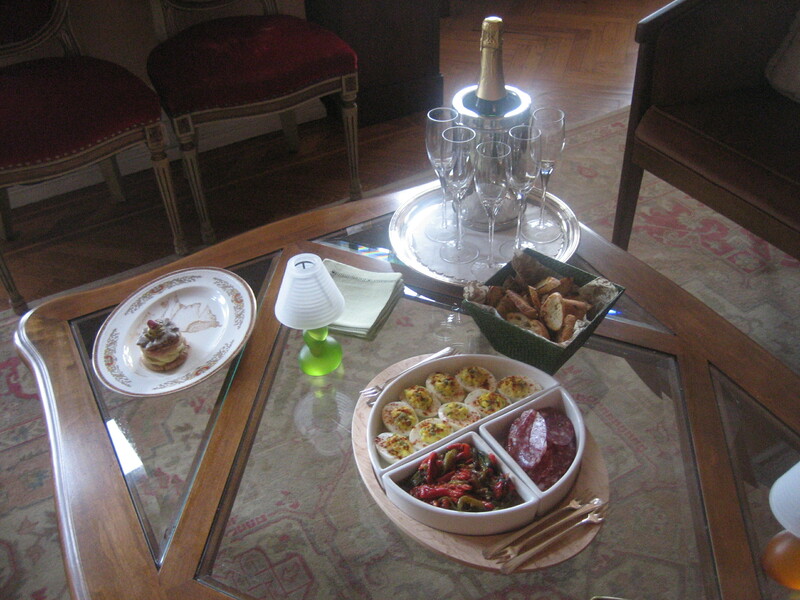 In fact, as host I have the responsibility to control the amount of wine guests drink. Alcohol is an area where the generous host is not the caring host. I am not concerned that this will be an issue with our guests, but as moderation in portion size is a goal of my dinner, that extends to wine. On Monday At Home blog readers received an email from me about At Home’s Mother’s Day Special. The special includes an inscribed book by me to your mother, a Pascal Lemaitre Mother’s Day Card, a recipe card with my mother’s Stuffed Cabbage Recipe, and an At Home book plate for you to inscribe your own message. Check your Monday email. Note: At Home’s Mother’s Day Special is not available from our online store. You have to use the order form that comes with the email. 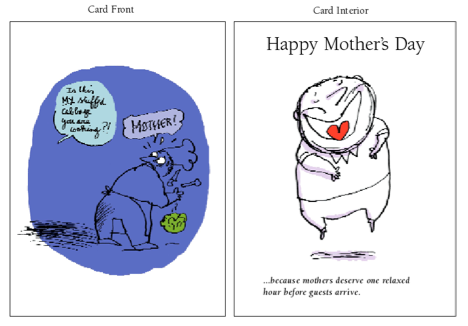 You can also access the At Home Mother’s Day Special and download the order form by going to the blog site. If you read the blog via email or on Facebook, just click on the blog title to get to the blog site. There are countless reasons to entertain at home and as many styles of entertaining. We spotted Pascal, Manou and Maelle under the McDonald’s awning. 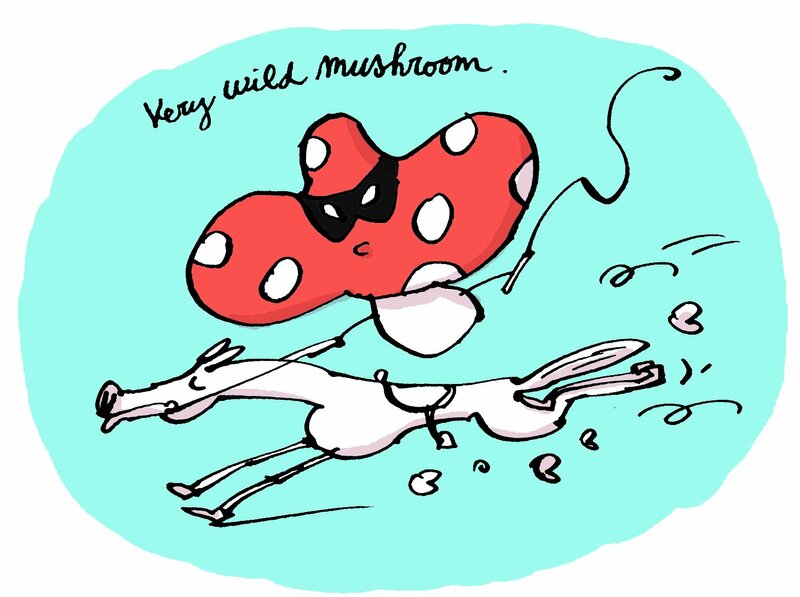 Pascal Lemaitre is my friend and illustrator of my soon-to-go-to-the-printer book. A McDonald’s acolyte, Pascal insisted they were simply staying out of the sun and not exiting from a Big Mac. This was not just any McDonald’s awning, but the one across the street from New York’s Union Square super greenmarket. While it does not rival San Francisco’s Ferry Terminal market, it’s a certified member of my farmers’ markets hall of fame. Our dear Belgian friends were in Brooklyn for the summer. With my every waking hour seemingly going into the finishing touches of the book and development of the website, social times have been few and far between. Spending time with friends is precious. I feared they would soon fly home with only their brief visit to Philadelphia to count as our time together. So we traveled up to New York. 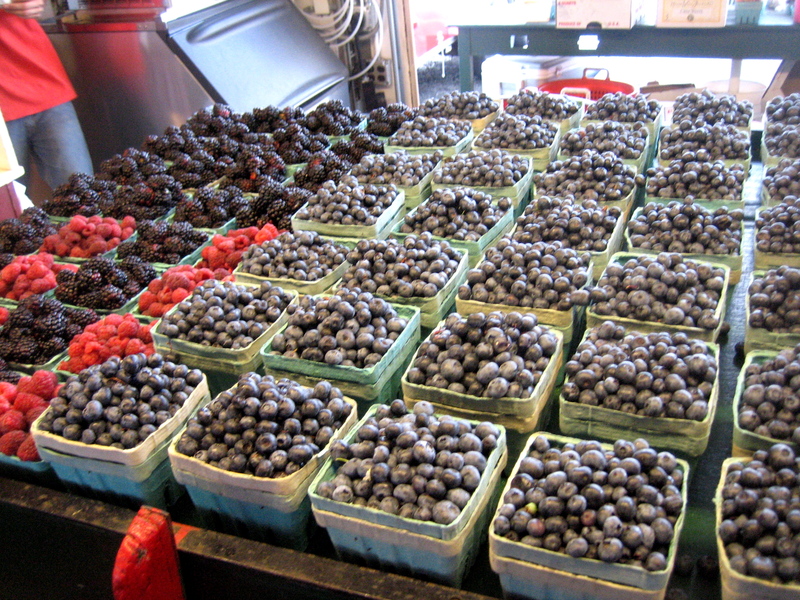 At eleven AM on this perfect August Saturday the market was bursting. Our plan was to shop the market, return home and after some communal chopping, slicing, dicing and just a little cooking, a perfect summer’s lunch at home. Home happened to be my brother Fred and sister-in-law Nancy’s Tribeca apartment — a sort of home away from home for us. As a finishing touch, organic eggs cooked in sausage renderings — over easy or sunny-side up — served over grilled bread left-over from our previous night’s at home Middle Eastern take-out dinner together. If someone, somewhere was having a better lunch, I’d like to know about it. You could have this lunch. It’s nearly all just summer shopping in a farmers’ market, a little shared prep work and then, sitting down with friends and enjoying the fruits (and vegetables) of your modest labors — at home. If you enjoyed this post, please pass it along to friends and family.